Fig. 1. Umm Qeis/Gadara and its hinterland. 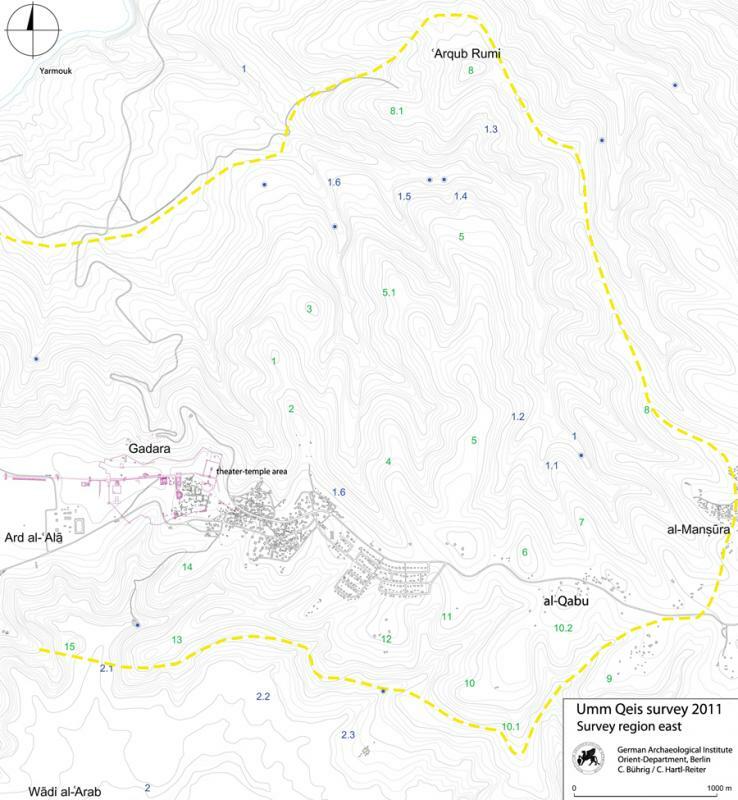 Topographical map of the eastern part of the Umm Qeis Hinterland Survey, including the hilltop sanctuaries on al-Qabu and on 'Arqub Rumi (drawing by C. Bührig and C. Hartl-Reiter). Fig. 2. Umm Qeis/Gadara and its hinterland. 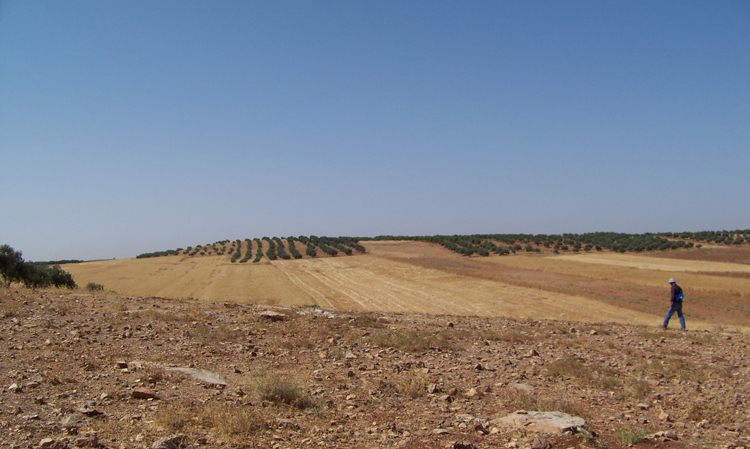 View to the south from 'Arqub Rumi to the hilltop sanctuary on al-Qabu (C. Bührig). Fig. 3. 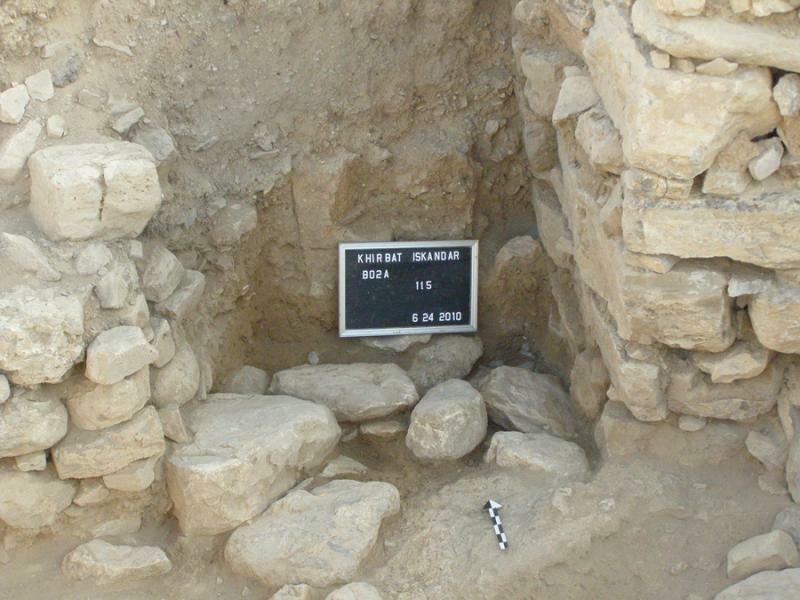 A Roman grave with loculi and sarcophagus near Natfe, found during the Wadi al-'Arab survey (courtesy Wadi al-'Arab Survey Project). Fig. 4. Parcels surveyed to the east of al-Turra (T. Greer). Fig. 5. 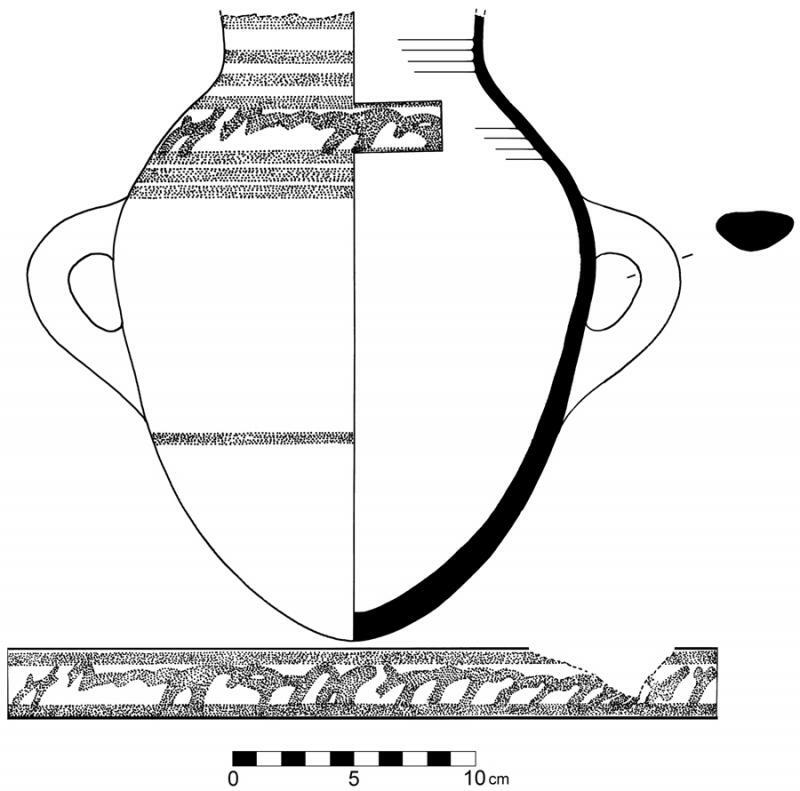 Charts comparing pottery distribution in al-Turra by period (drawing by D. Byers). Fig. 6. 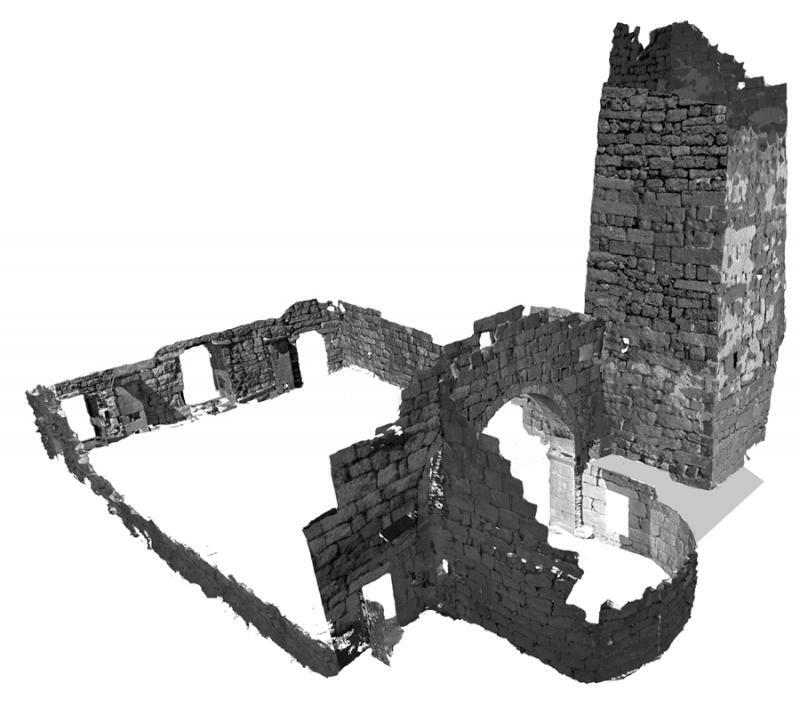 RGB point clouds of the Church of Saints Sergius and Bacchus at Umm al-Surab (courtesy Umm al-Surab Project). Fig. 7. 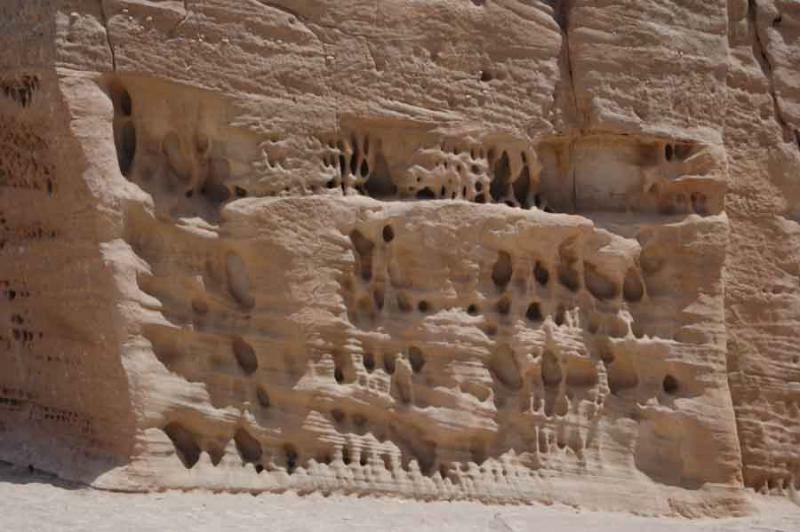 South-facing Caves 1–4 of Mughr el-Hamamah. 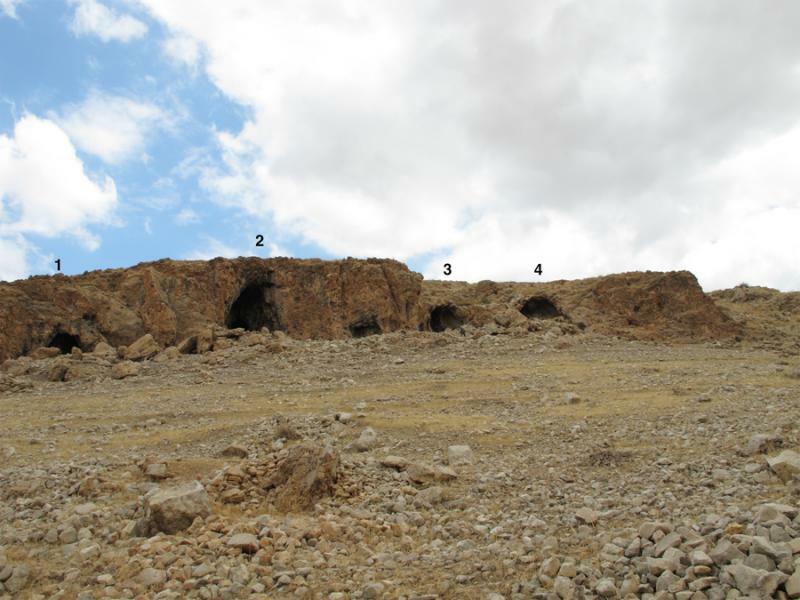 Cave 5 (right) is located approximately 30 m to the east. 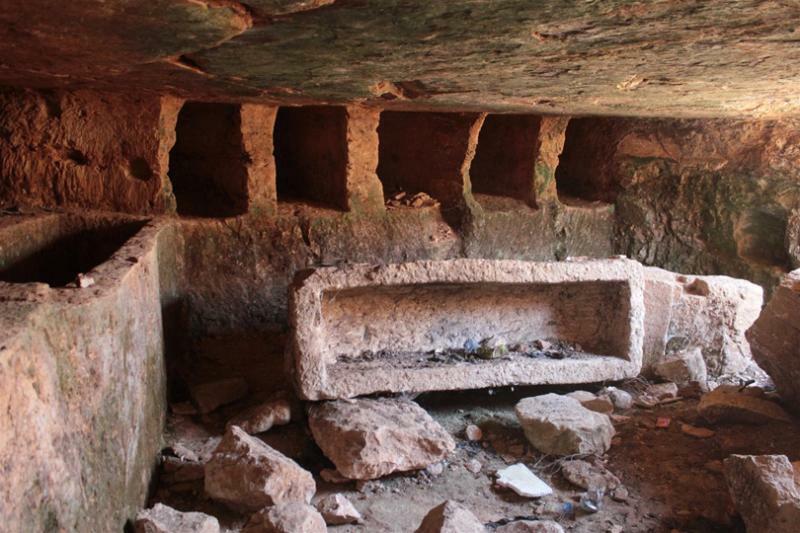 Only Cave 2—the main cave—has substantial in situ prehistoric deposits, and test excavations focused on the front chamber of this cave (courtesy Mughr el-Hamamah Project). Fig. 8. 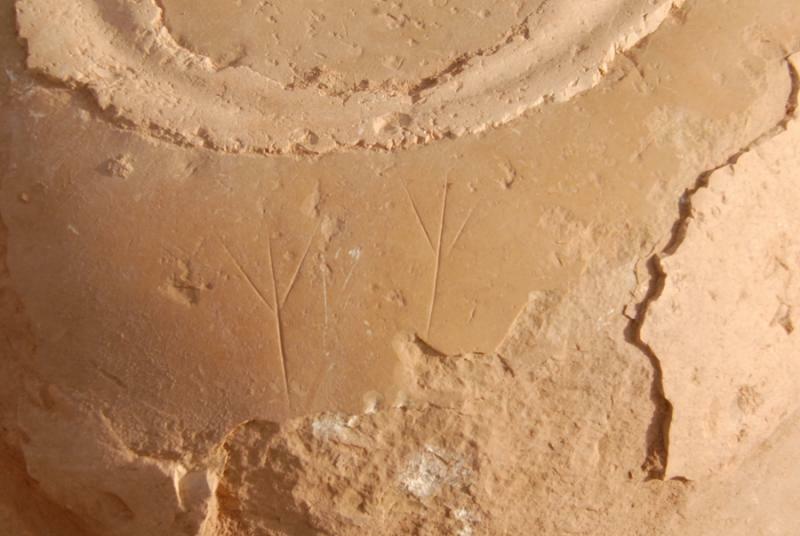 Early Iron Age jar with script-like decoration from phase X at Tell Abu al-Kharaz (courtesy Tell Abu al-Kharaz Project). Fig. 9. 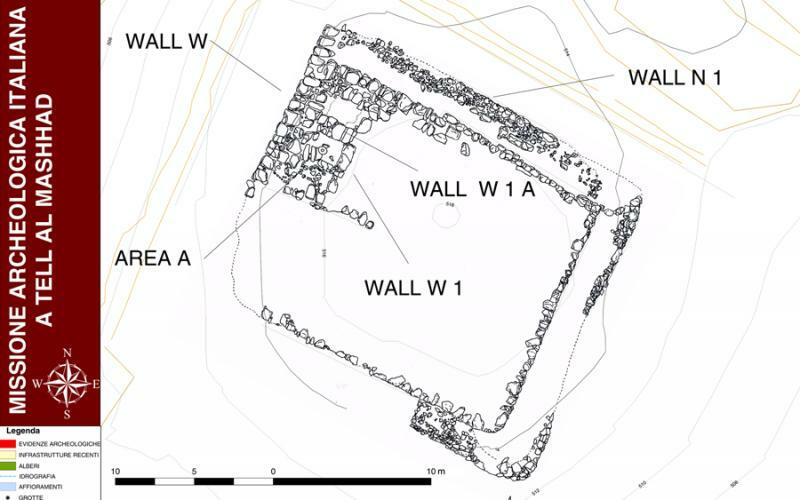 Plan of Iron Age I compound (phase IX) at Tell Abu al-Kharaz (courtesy Tell Abu al-Kharaz Project). Fig. 10. 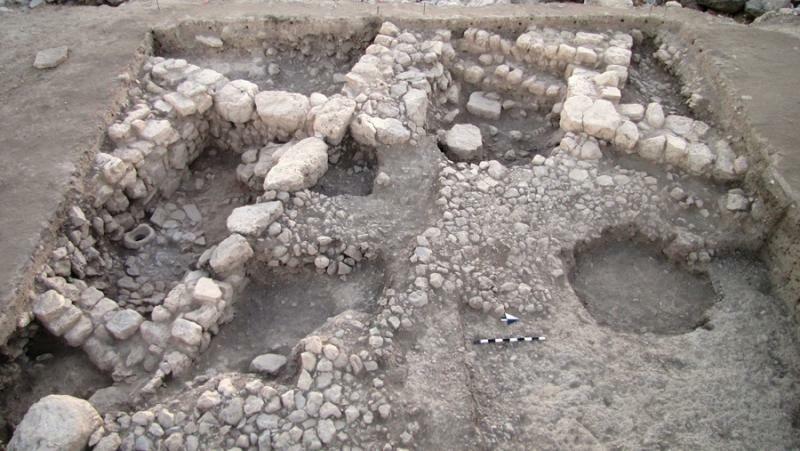 Iron Age I compound from photograph tower (phase IX) at Tell Abu al-Kharaz (M. Al-Bataineh). Fig. 11. 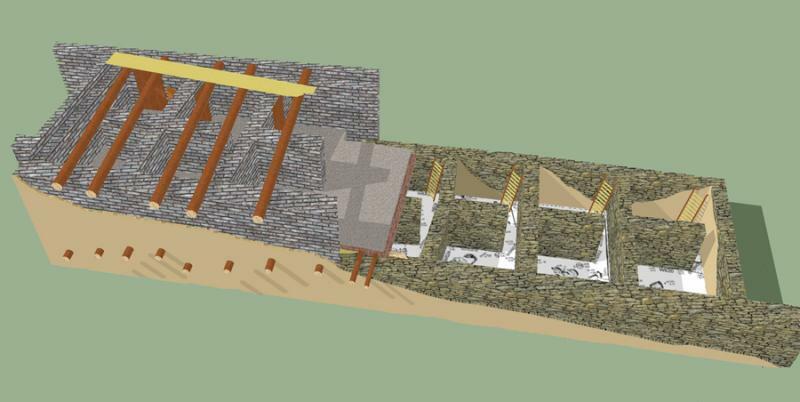 Reconstruction of Iron Age I compound (phase IX) at Tell Abu al-Kharaz (courtesy Tell Abu al-Kharaz Project). Fig. 12. 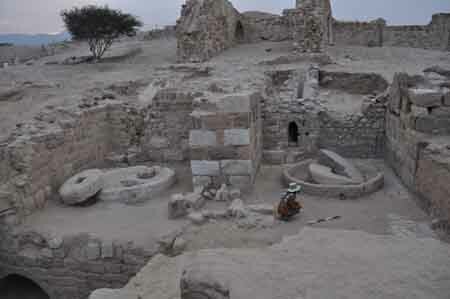 Scarab and scaraboid from the Iron Age I compound at Tell Abu al-Kharaz (phase IX) (courtesy Tell Abu al-Kharaz Project). Fig. 13. 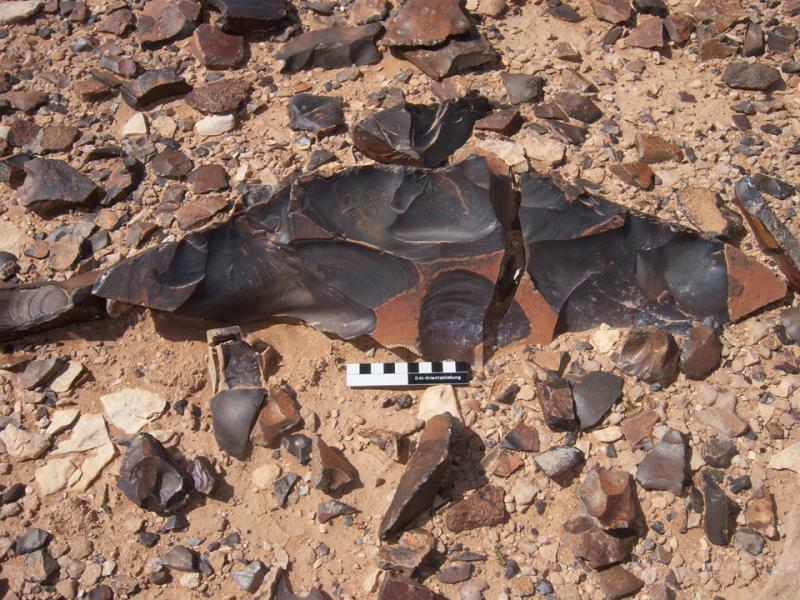 Cortical flake core from site RUW 1.17 in the larger Wadi Ruweishid flint-mining region (B. Müller-Neuhof). Fig. 14. 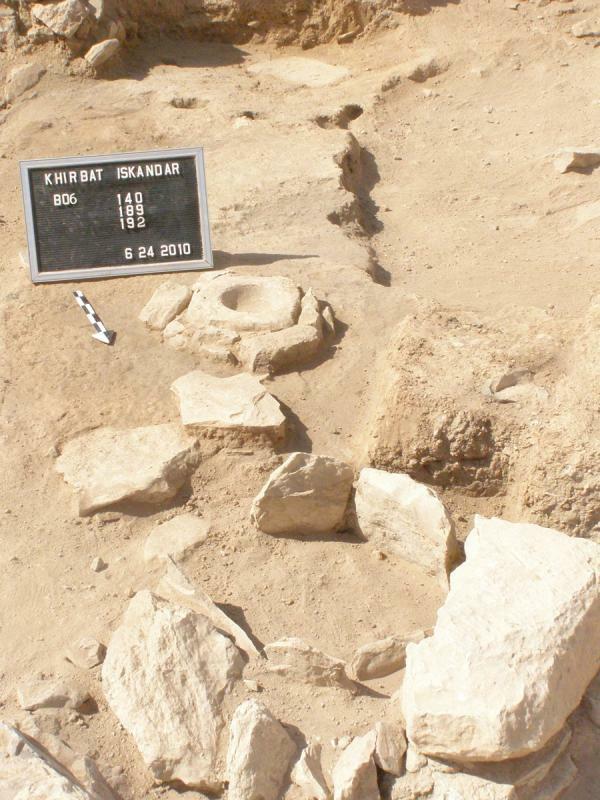 Chalcolithic/Early Bronze Age I campsite with remains of pen structures in Marrab al-Khidari (site XII-9) at the northeastern border of the basalt desert (B. Müller-Neuhof). Fig. 15. 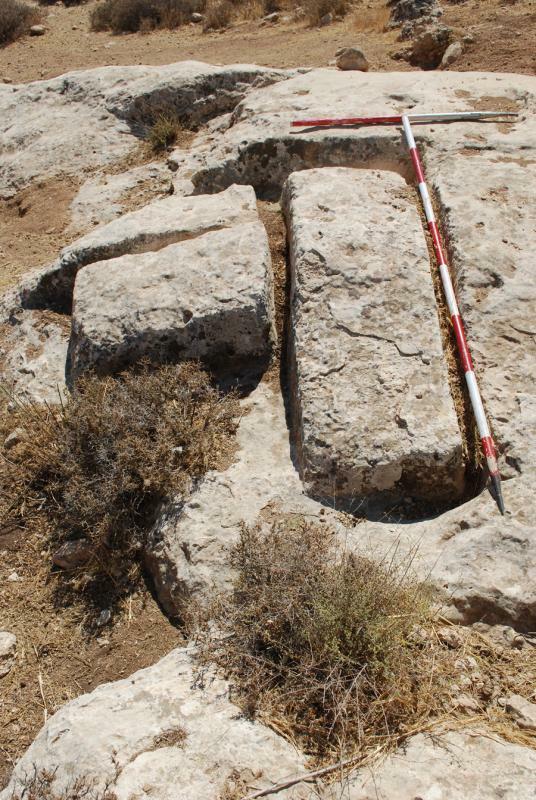 Abandoned and half-removed quarry blocks at site 716 of the Jarash Hinterland Survey (courtesy Jarash Hinterland Survey Project). Fig. 16. 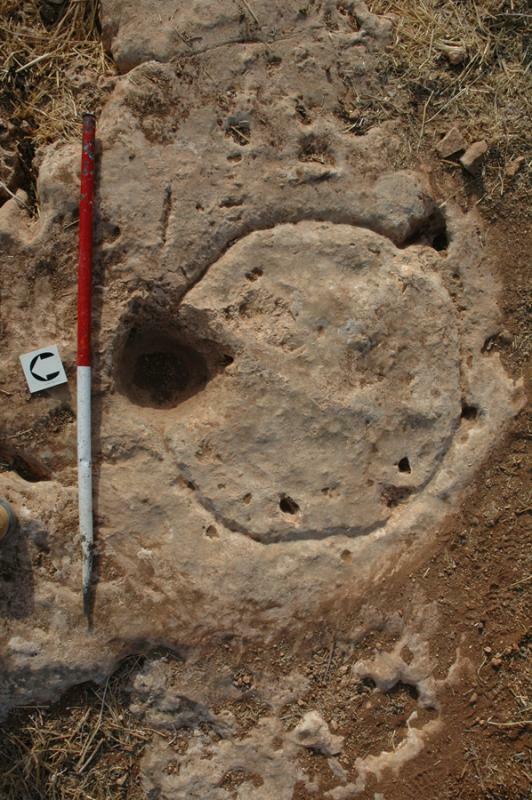 Petroglyph site 2003 of the Jarash Hinterland Survey (courtesy Jarash Hinterland Survey Project). Fig. 17. Petroglyph site 621 of the Jarash Hinterland Survey (courtesy Jarash Hinterland Survey Project). Fig. 18. 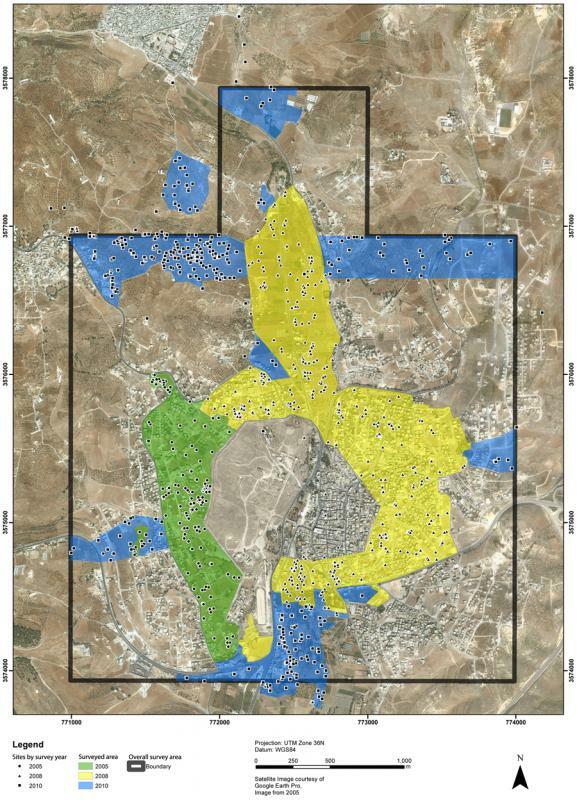 Areas covered in the Jarash Hinterland Survey in 2005, 2008, and 2010, including all sites (courtesy Jarash Hinterland Survey Project). Fig. 19. 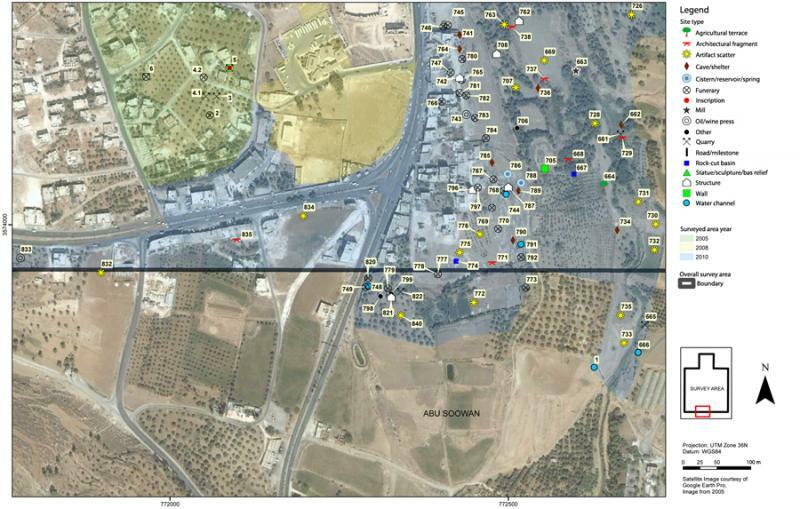 Jarash Hinterland Survey 2010, north part of south Jarash and Tell Abu Suwwan, showing site numbers and types (courtesy Jarash Hinterland Survey Project). Fig. 20. 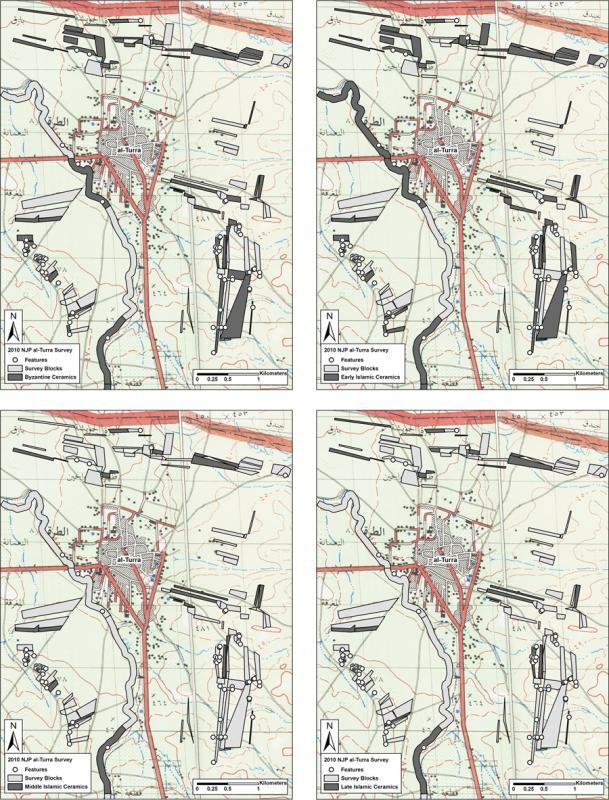 Jarash Hinterland Survey 2010, south part of south Jarash and Abu Suwwan, showing site numbers and types (courtesy Jarash Hinterland Survey Project). Fig. 21. 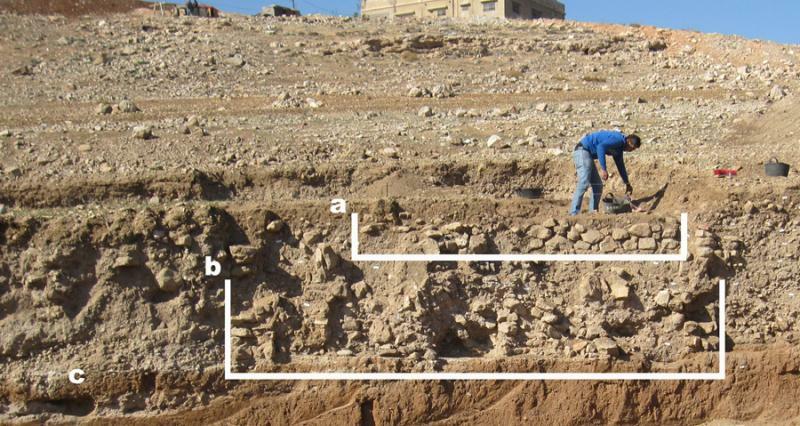 The south face of the qibla wall (right), the later mihrab (far right), and the original mihrab (left) of the Early Islamic mosque at Jarash, showing foundation arrangements (courtesy Late Antique Jarash Project). Fig. 22. 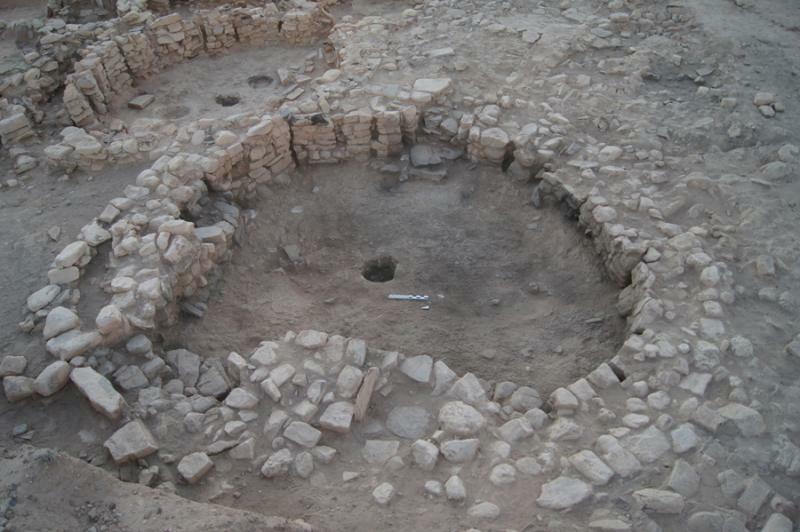 General view over the macellum kiln after excavation of the Early Islamic mosque at Jarash (courtesy Late Antique Jarash Project). Fig. 23. 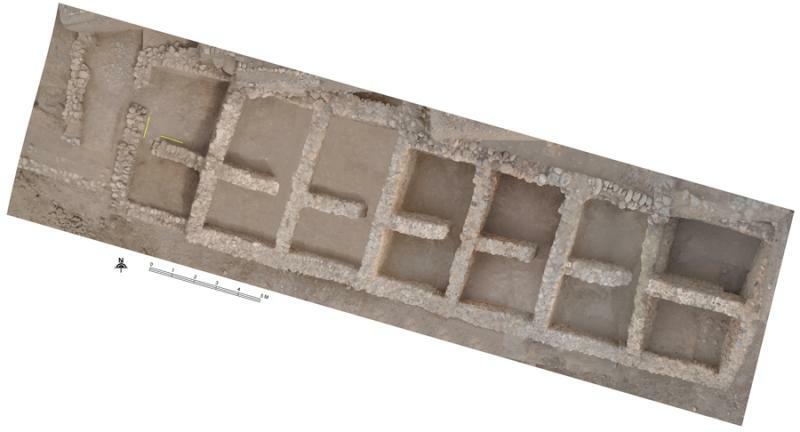 Plan of Areas B, C, and D at Jarash, with a section of the street (courtesy Late Antique Jarash Project). Fig. 24. 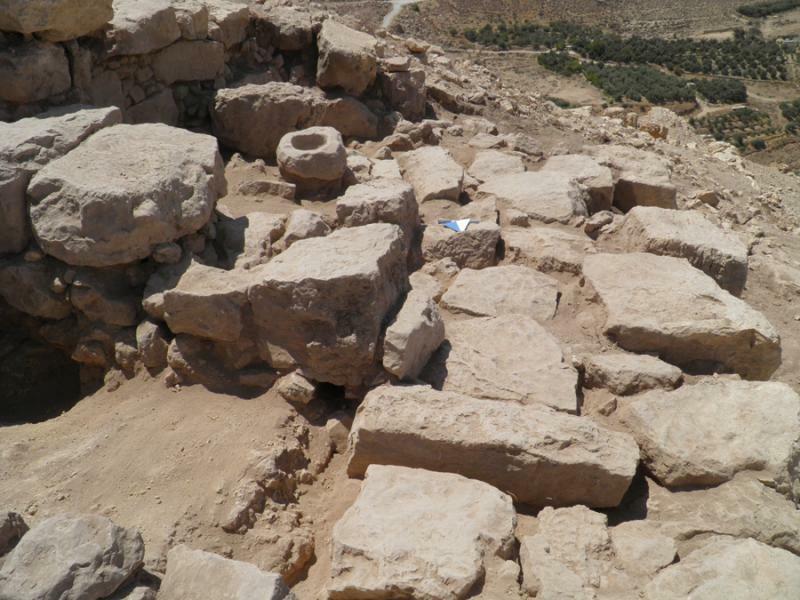 General view of bedrock cuts in Area B at Jarash, with tank and cistern (courtesy Late Antique Jarash Project). Fig. 25. 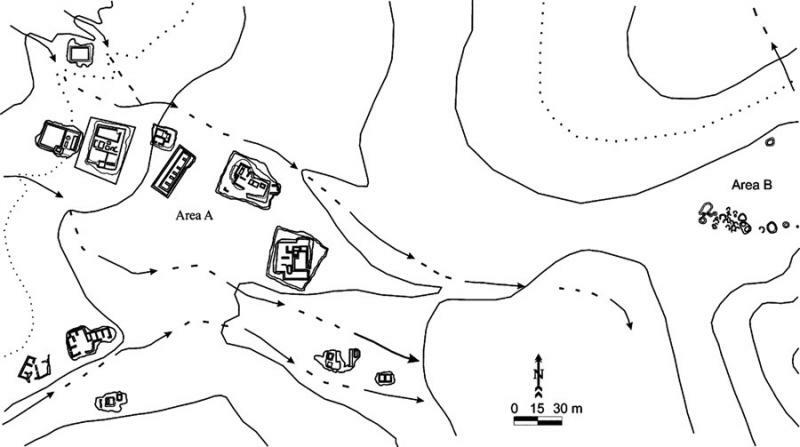 Plan of Area A at Jarash (courtesy Late Antique Jarash Project). Fig. 26. 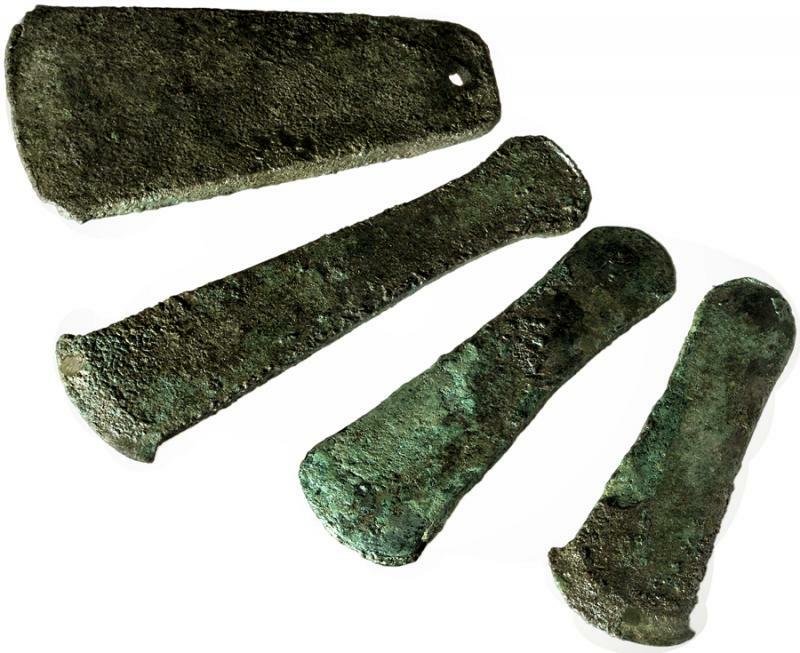 The four copper axes retrieved in a cachette in Pillared Hall (L.1040) in Palace B at Khirbet al-Batrawy (Zarqa) (L. Nigro). Fig. 27. The assemblage from Pillared Hall (L.1040) in Palace B at Khirbet al-Batrawy (Zarqa), which includes pithoi, red-burnished jugs and pointed juglets, medium-sized jars, ceremonial vessels with applied decorations of snakes and scorpions, and noteworthy objects, among which are a bone knife and several worked bones, pierced seashells, and a carefully worked basalt potter's wheel (L. Nigro). Fig. 28. 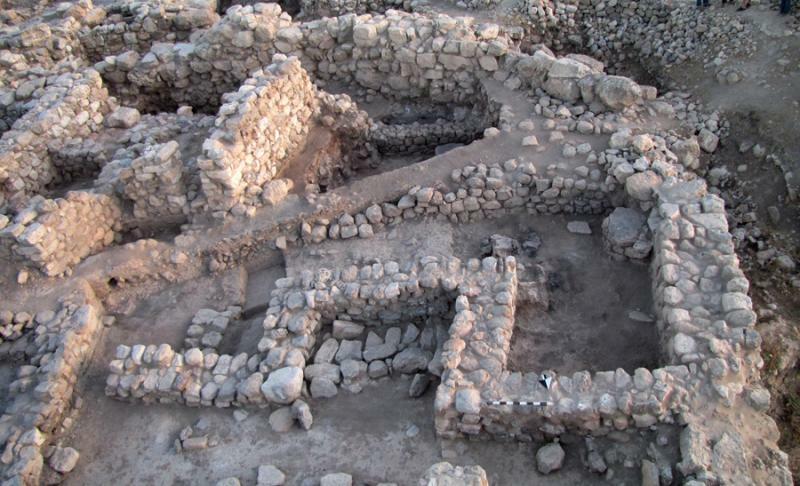 The Pillared Building (Building 4), Area IV at Jneneh (K. Douglas). Fig. 29. 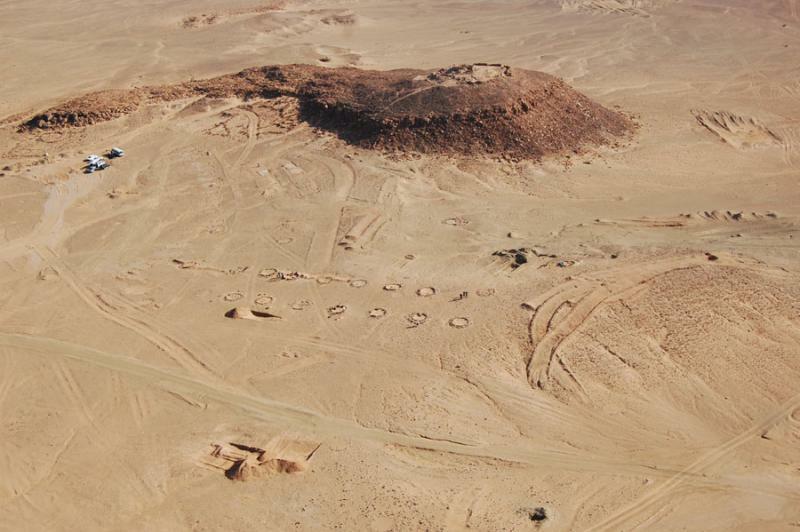 Aerial view of the western part of 'Ain Ghazal: a, the area bulldozed in July 2011; b, the Central Field, excavated in 1982–1996; c, the North Field, excavated 1993–1996 (D. Kennedy; © Aerial Photographic Archive for Archaeology in the Middle East). Fig. 30. 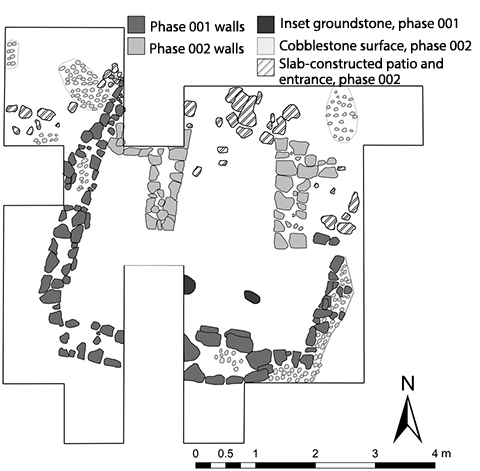 West section III.1 in the West Field: a, remains of the Yarmoukian structure containing the burial; b, the Pre-Pottery Neolithic C house; c, the area sampled from Floor F-2 (G. Rollefson). Fig. 31. 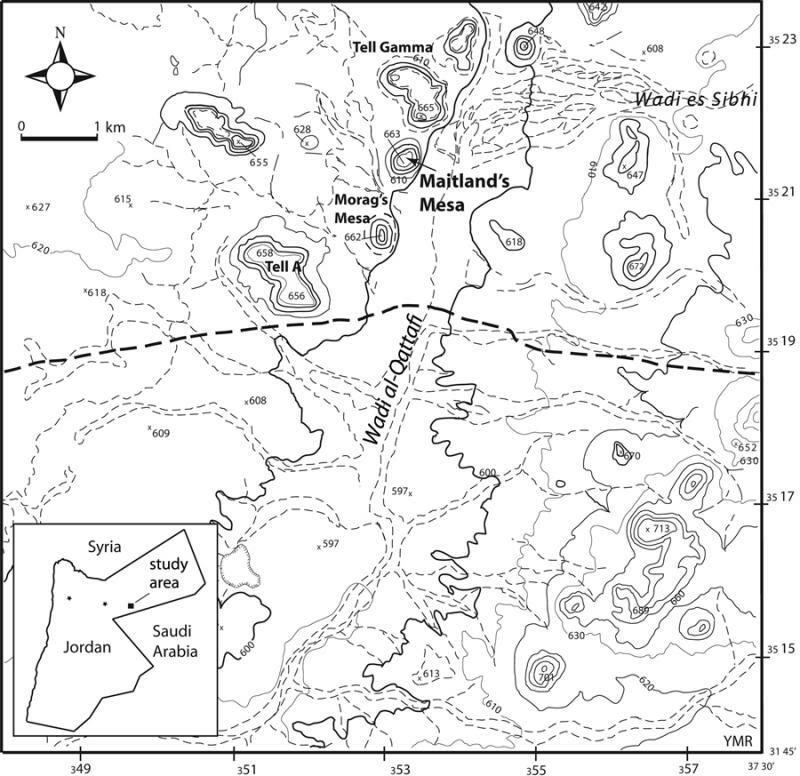 Map of Wadi al-Qattafi and Maitland's Mesa (courtesy Eastern Badia Archaeological Project). Fig. 32. 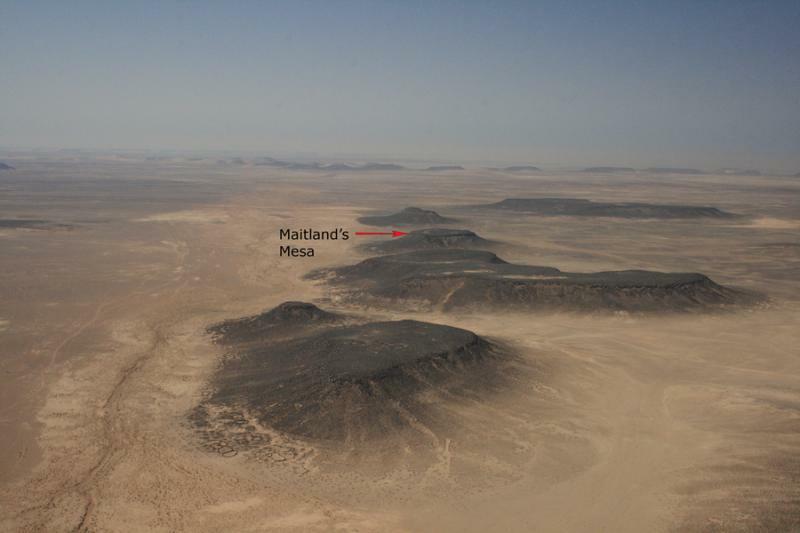 Area of basalt-capped plateaus along Wadi al-Qattafi, looking south toward Maitland's Mesa (I. Ruben). Fig. 33. 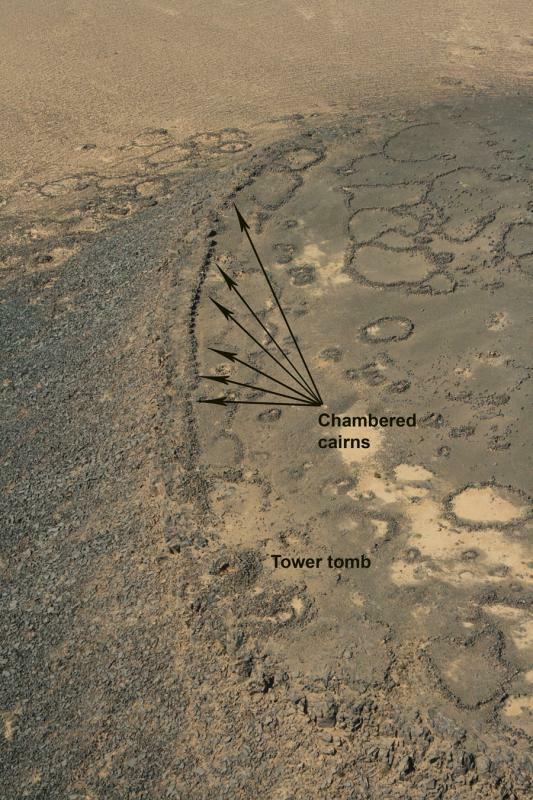 Aerial view of Maitland's Mesa, showing a large tower tomb with a chain of chambered stone cairns to the south, following the plateau's edge (I. Ruben). Fig. 34. 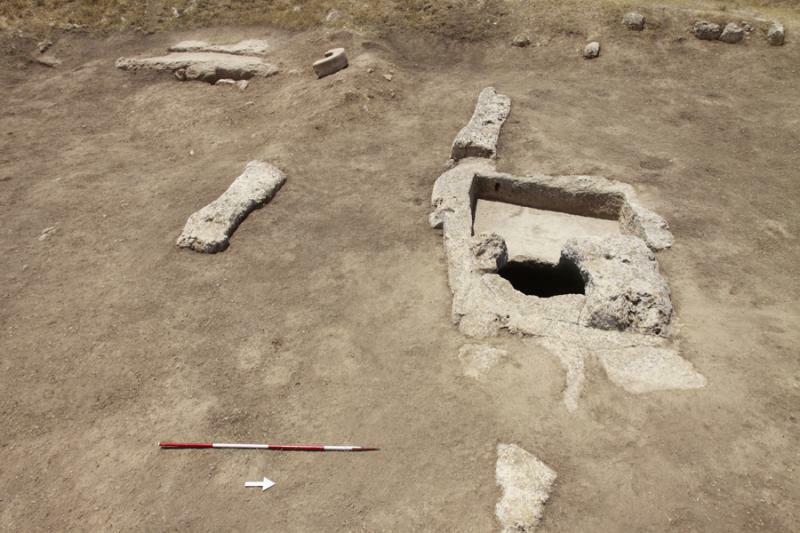 Wisad Pools, Structure W-66, a corbeled dwelling dating to the Late Neolithic (ca. 6,500–6,000 B.C.E. 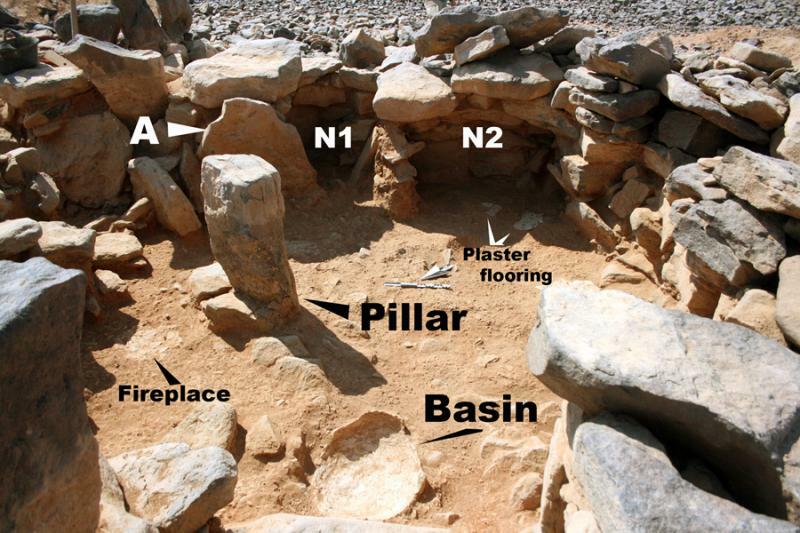 ): A, "shouldered" stone to the east of the pillar that acted as a roof support; N1, N2, constructed niches (G. Rollefson). Fig. 35. 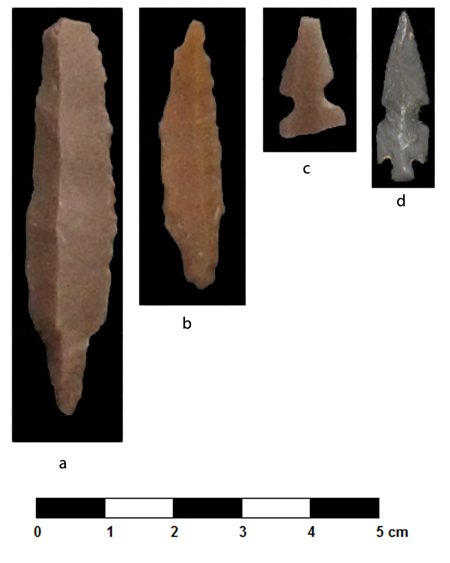 Late Neolithic arrowheads from Structure W-66; a, Haparsa arrowheads; b, transverse arrowheads (G. Rollefson). Fig. 36. 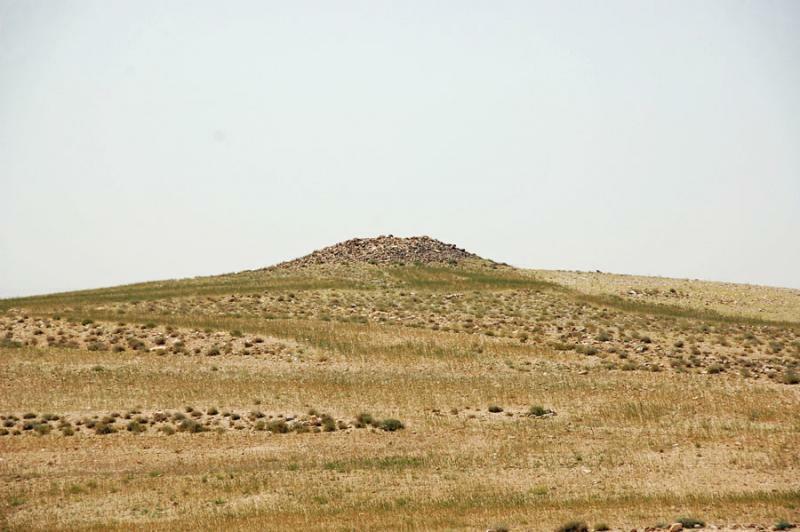 Tall al-'Umayri, field A, Late Bronze/Early Iron I domestic structures (courtesy Tall al-'Umayri Project). Fig. 37. 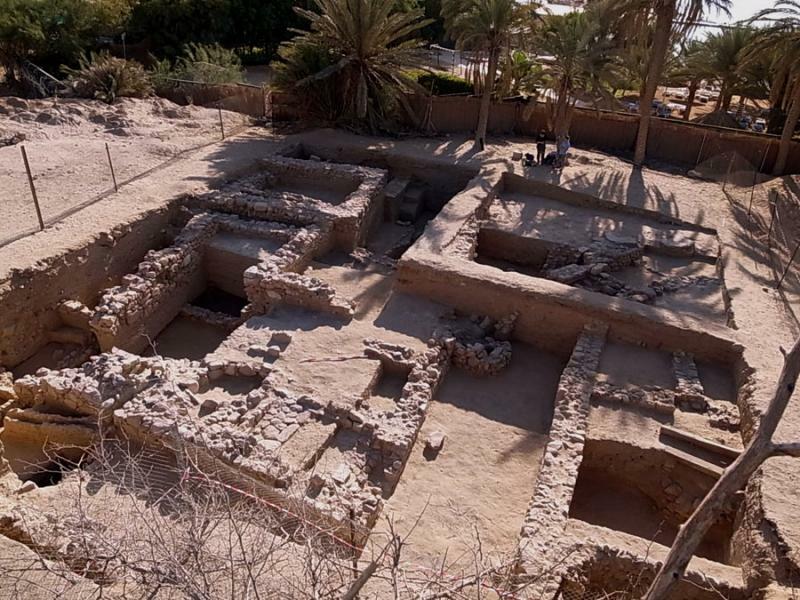 Tall al-'Umayri, field H, Early Iron I possible four-room building (courtesy Tall al-'Umayri Project). Fig. 38. 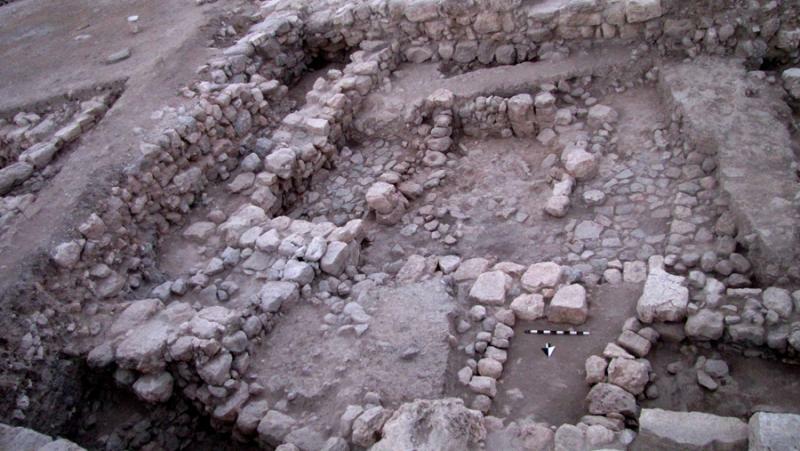 Tall al-'Umayri, field M, Late Iron II/Persian courtyard and attached structures (courtesy Tall al-'Umayri Project). Fig. 39. 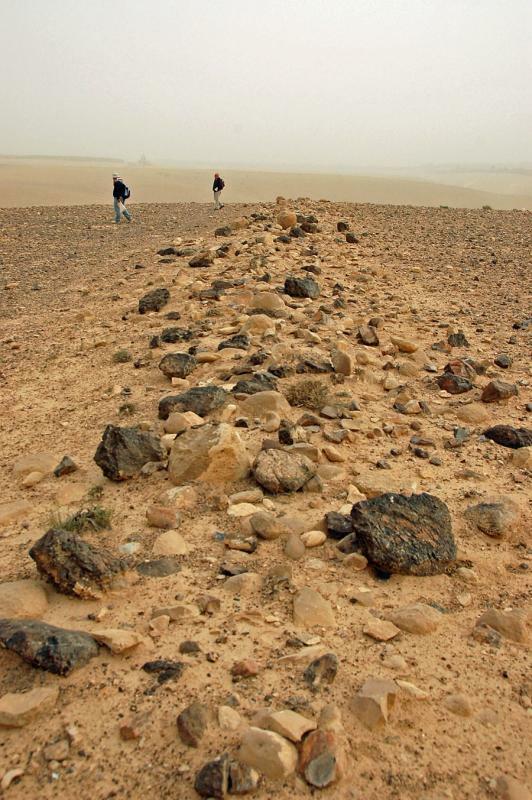 Tall al-'Umayri, field H, southern face of Wall 4 (courtesy Tall al-'Umayri Project). Fig. 40. 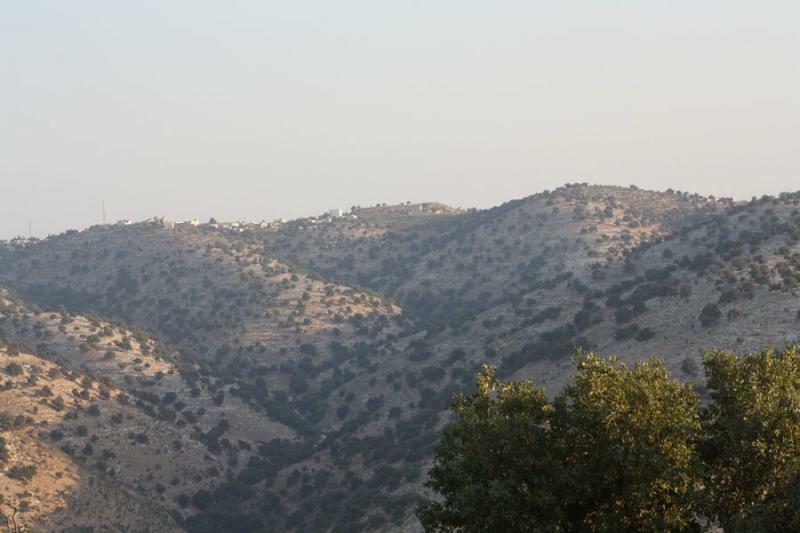 Tall al-Kafrayn, view from the east (K. Xenikakis and S. Yessafidis). Fig. 41. 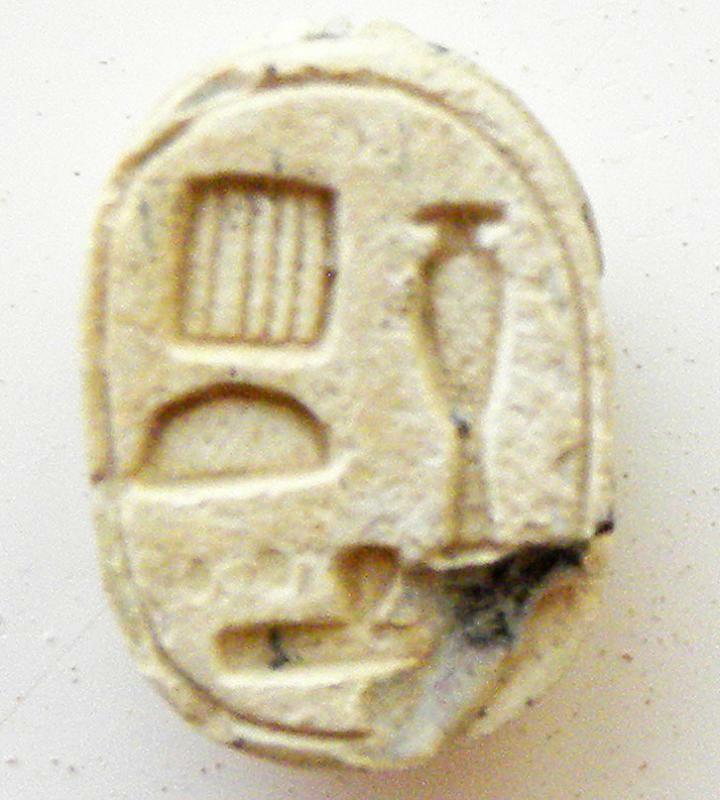 Egyptian scarab from Tall al-Kafrayn (courtesy Hellenic Archaeological Expedition). Fig. 42. 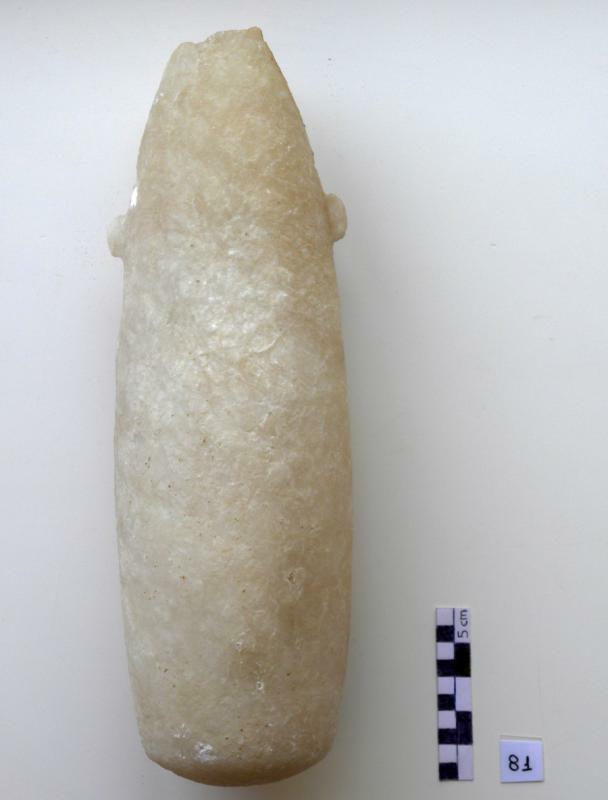 Alabaster vessel found at Tall al-Kafrayn (courtesy Hellenic Archaeological Expedition). Fig. 43. Building A at Tell al-Mashhad, view from northeast (F. Benedettucci). Fig. 44. 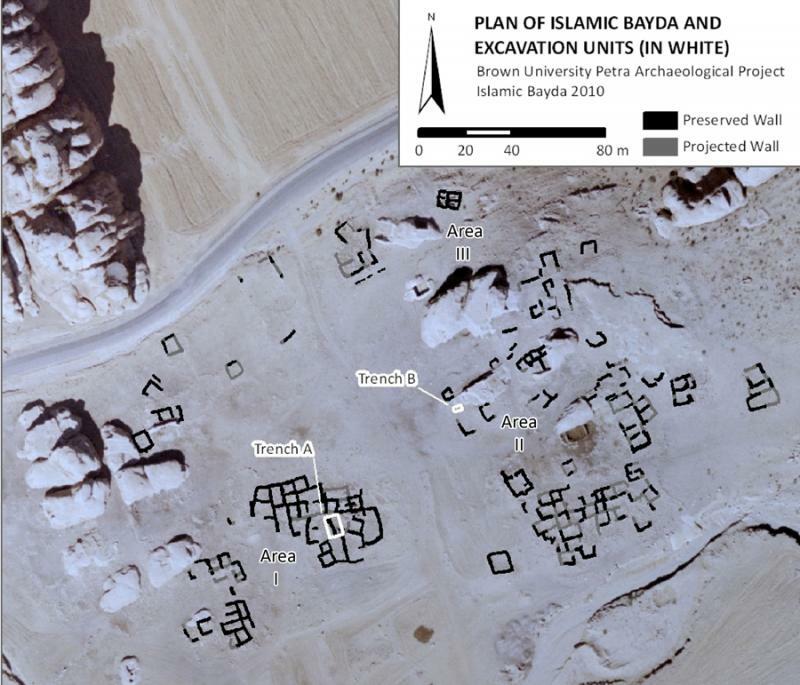 Plan of Building A at Tell al-Mashhad after the 2010 and 2011 campaigns (courtesy Missione Archeologica Italiana). Fig. 45. Area A at Tell al-Mashhad after excavation, view from northwest (F. Benedettucci). Fig. 46. 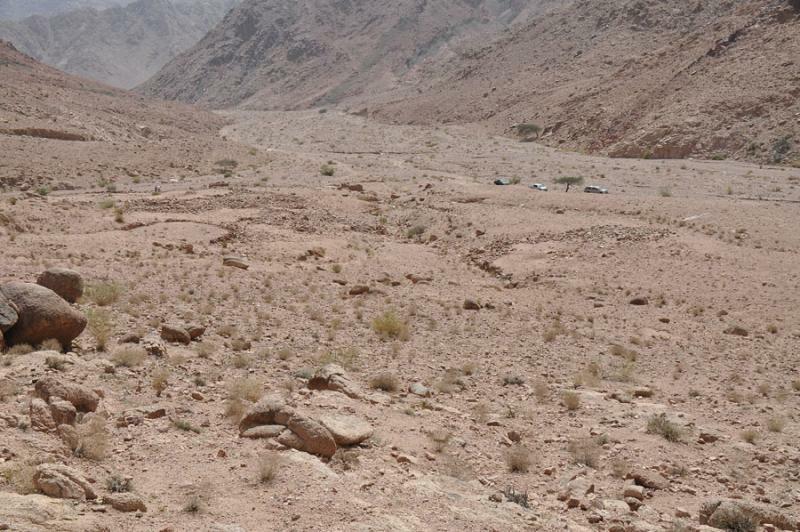 Qasr Mushash survey, showing large birkeh located north of Qasr Mushash (K. Bartl). Fig. 47. 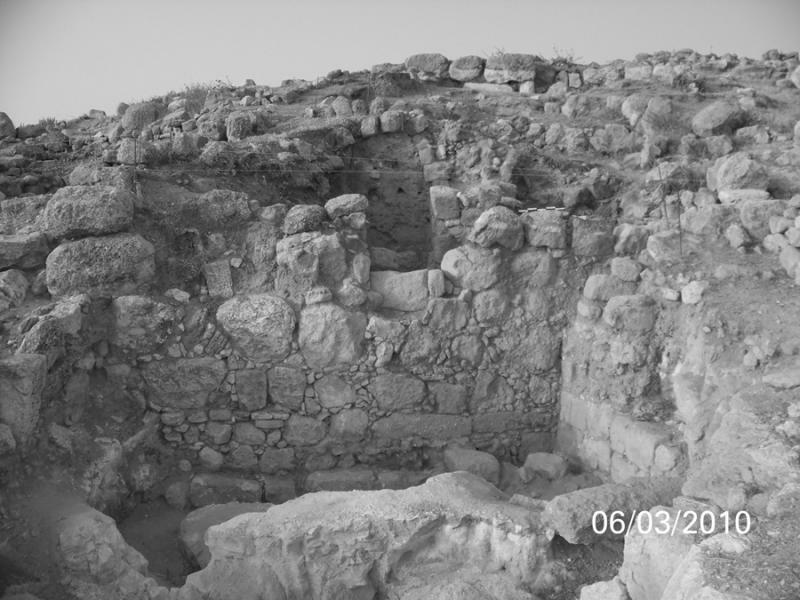 Series of Roman and Mamluk walls on the northern slope of Tall Hisban. 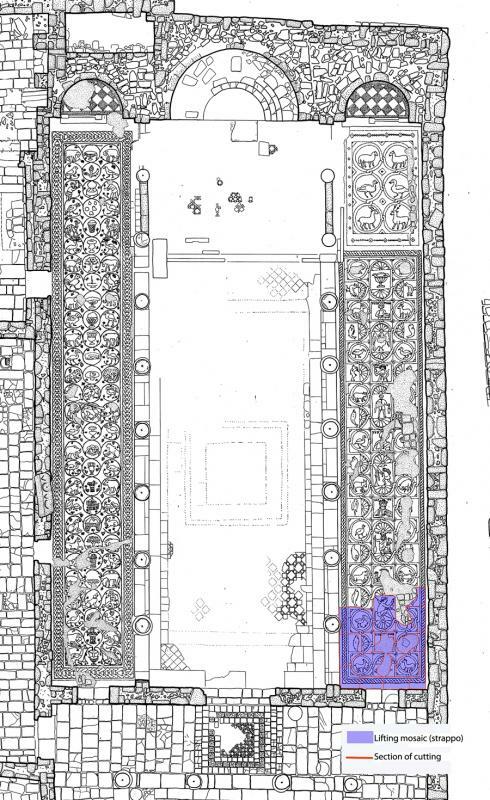 Note the doorway in the middle of the Mamluk wall at top (courtesy Tall Hisban Project). Fig. 48. 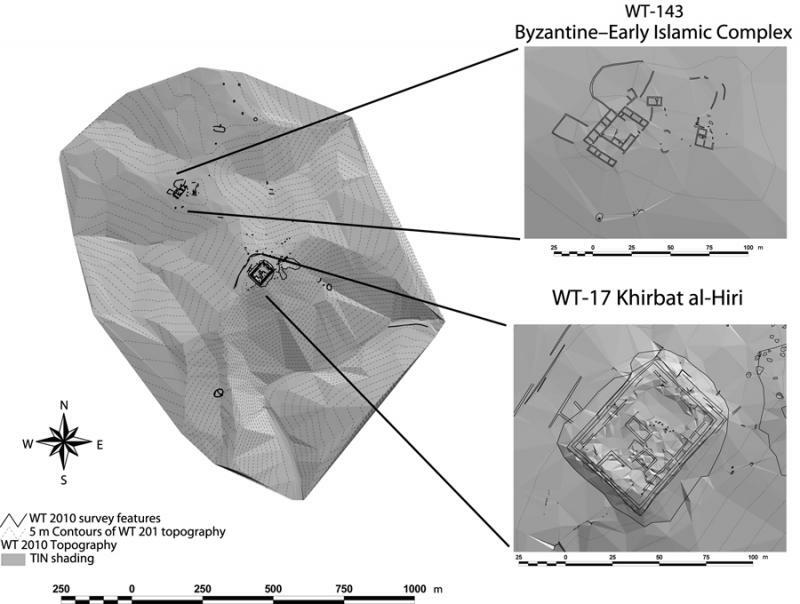 Topographic and architectural survey by the Wadi ath-Thamad Project in 2010, showing details of the Iron Age fortress Khirbat al-Hiri (WT-17) and a Byzantine–Early Islamic complex (WT-143) (courtesy the Wadi ath-Thamad Project). Fig. 49. 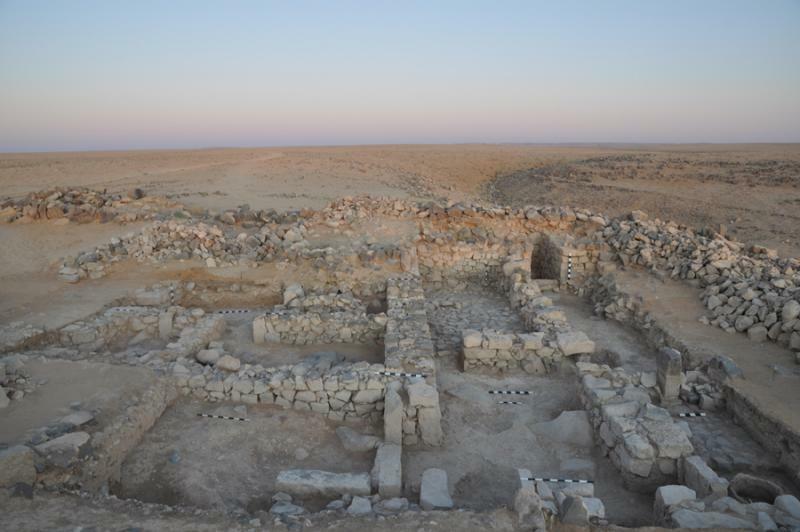 View of the central hall of Building 306, Khirbat al-Mudayna, facing southeast, showing pillars, doorways, and the foot of a staircase to an unpreserved upper story (courtesy Wadi ath-Thamad Project). Fig. 50. 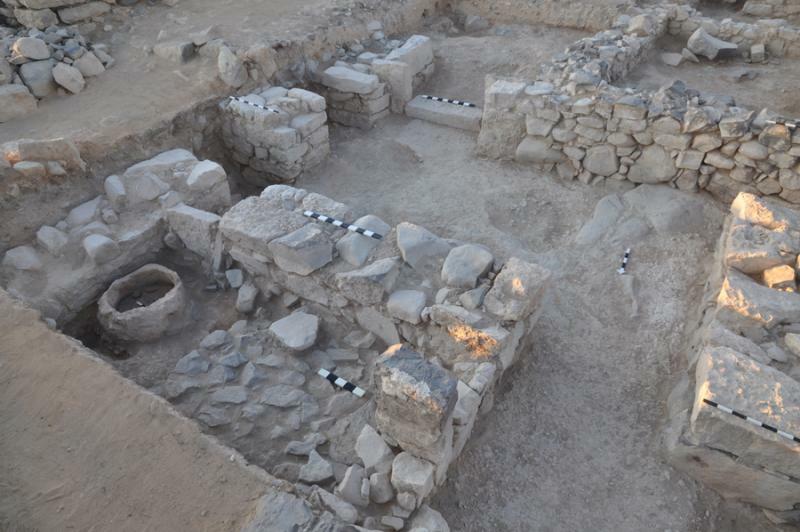 The square B6 courtyard at Khirbat Iskandar with bin, mortar, and postholes (G. Kochheiser). Fig. 51. 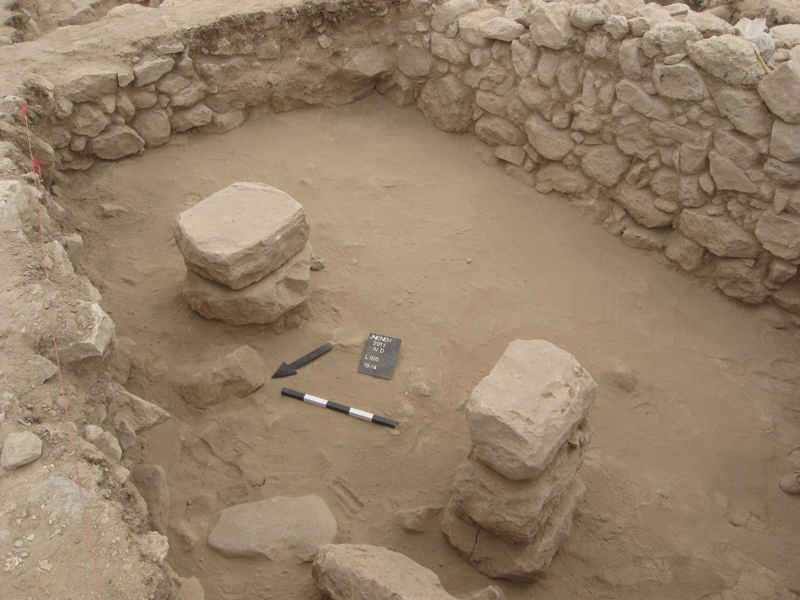 The square B21 room at Khirbat Iskandar (G. Kochheiser). Fig. 52. 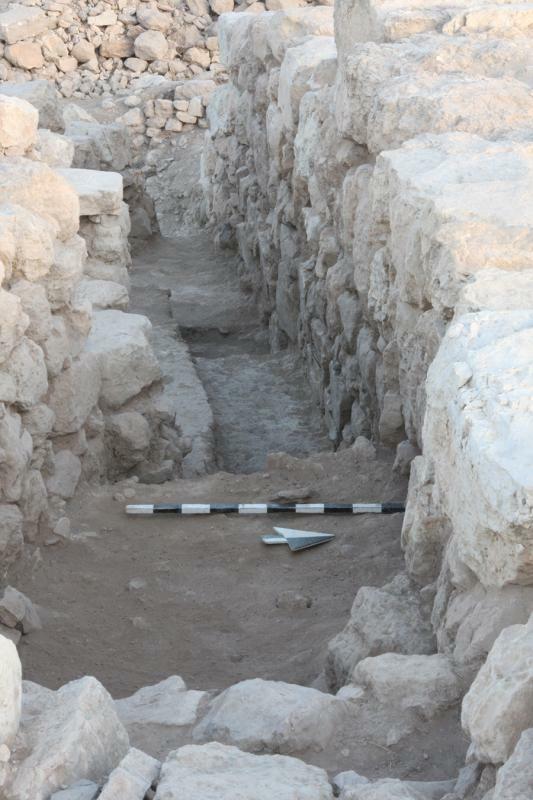 The founding level of the phase D fortifications running under the phase C tower at Khirbat Iskandar (G. Kochheiser). Fig. 53. Plan of Structure 001, al-Khayran, Jordan (drawing by E. Wallace). Fig. 54. 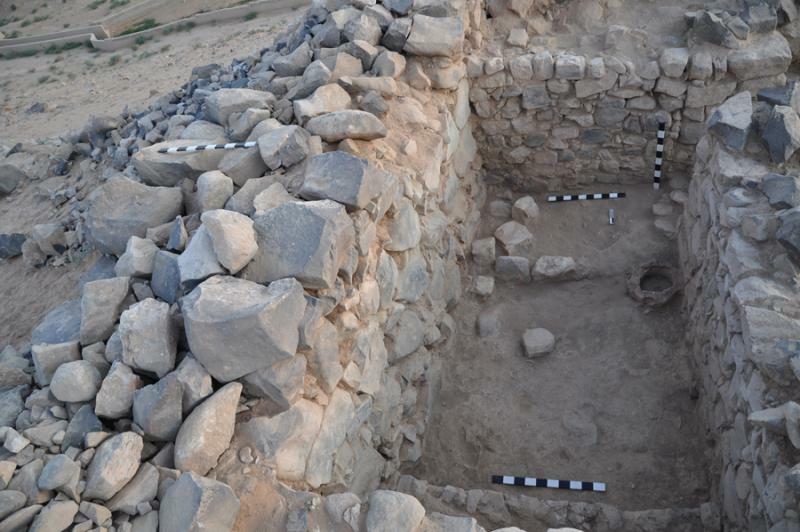 Point types from al-Khayran, Jordan: a, Byblos; b, A45; c, el-Khiam; d, Helwan (M. Kroot). Fig. 55. 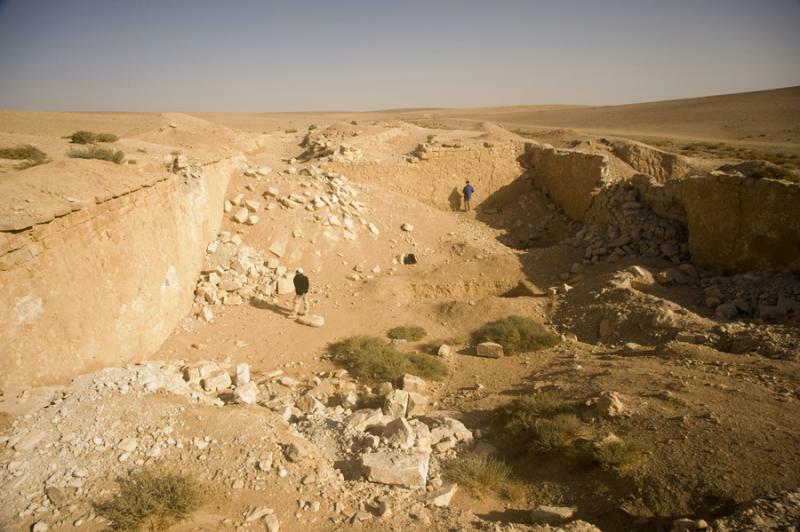 Final photograph of Khirbat al-Mudaybi', with an overview of excavation squares in field D, looking west (G. Mattingly). Fig. 56. 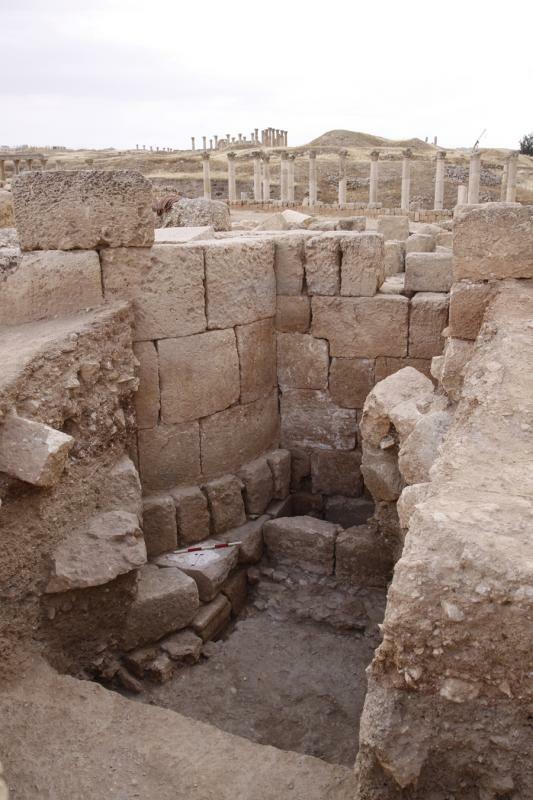 Large oven (tannur) in field D (square F4) at Khirbat al-Mudaybi', looking southeast (G. Mattingly). Fig. 57. 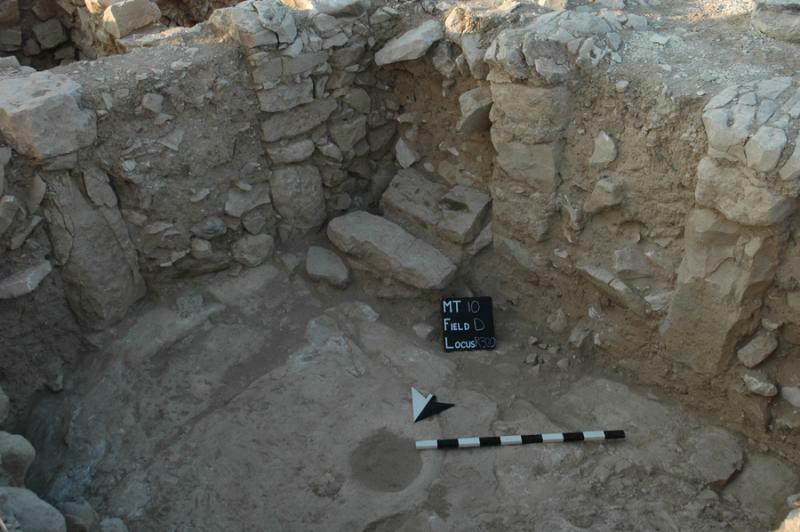 Iron Age room inside the field D casemate wall in the west wall of the fort at Khirbat al-Mudaybi', looking north (G. Mattingly). Fig. 58. 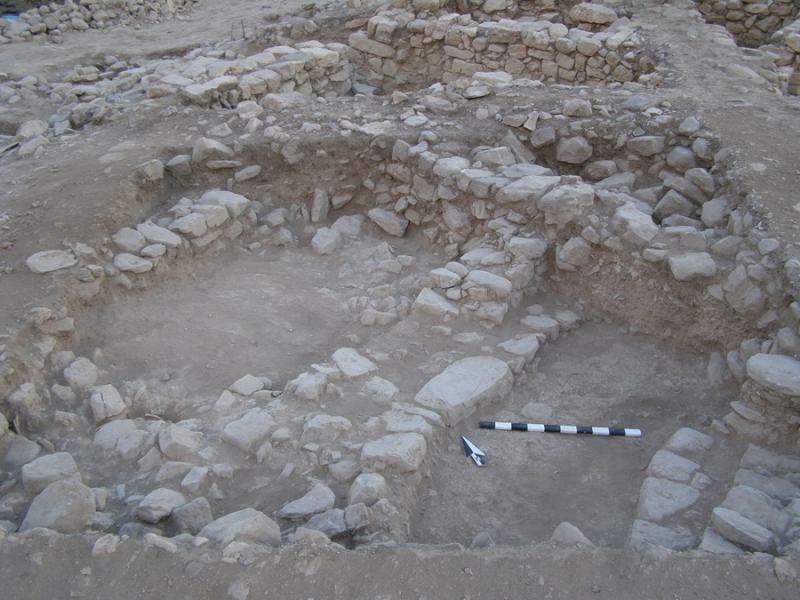 Rectangular communal building in Area IV at Wadi Hamarash (A. Sampson). Fig. 59. 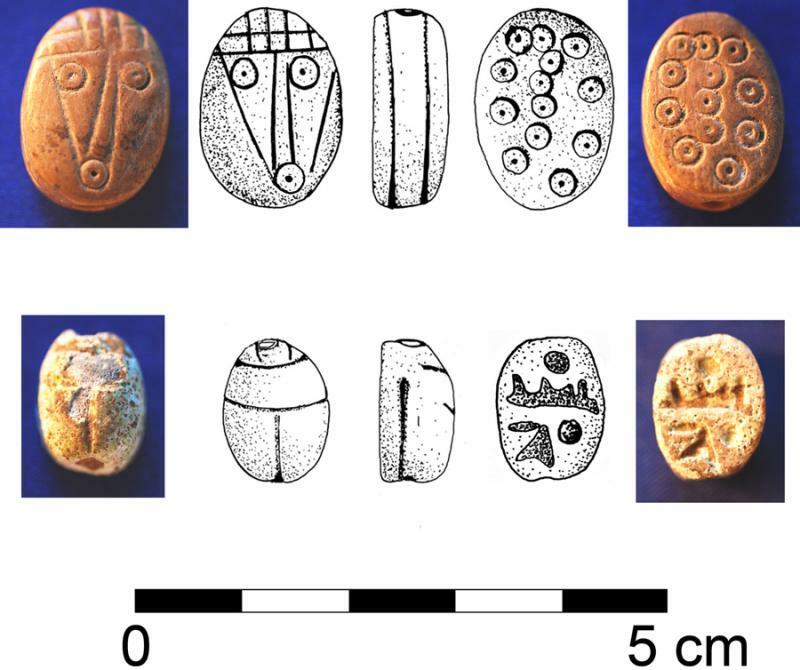 Incised symbols on a flint nodule from Wadi Hamarash (A. Sampson). Fig. 60. Plan of western Ma'asir as-Sukkar in Ghor es-Safi (drawing by A. Silkatcheva). Fig. 61. 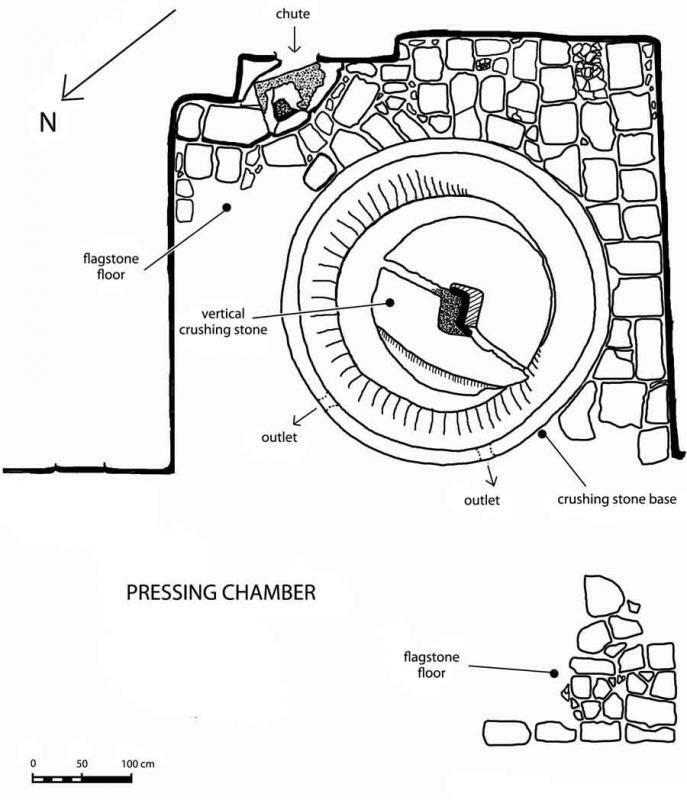 Crushing stones in the western pressing room at Ma'asir as-Sukkar (K. Politis). Fig. 62. 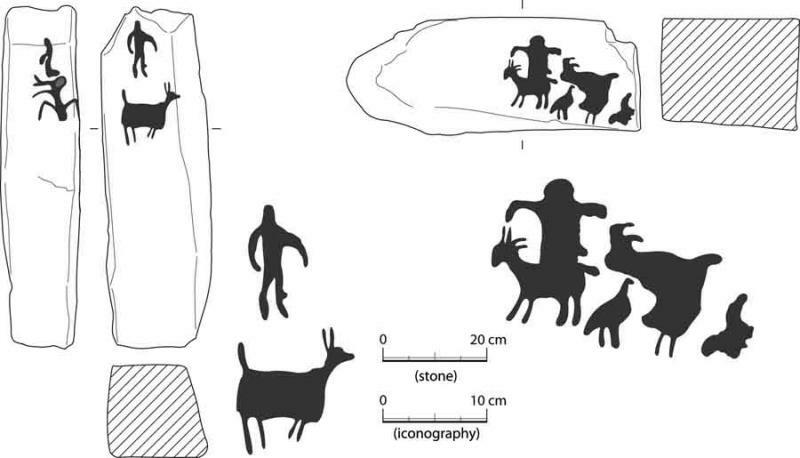 Petroglyphs from Wadi Ghuweir 17 in the Jafr Basin (courtesy S. Fujii). Fig. 63. 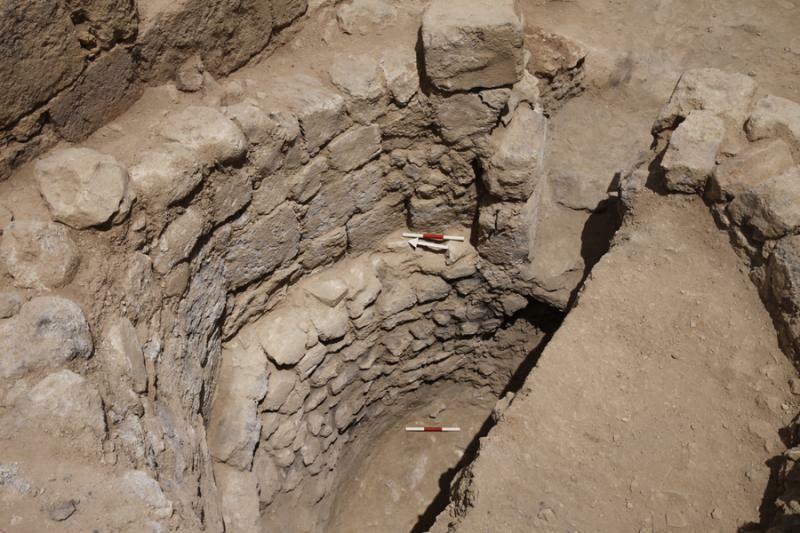 Barrage 1 of Wadi Nadiya 1 in the Jafr Basin (view to the west) (S. Fujii). Fig. 64. 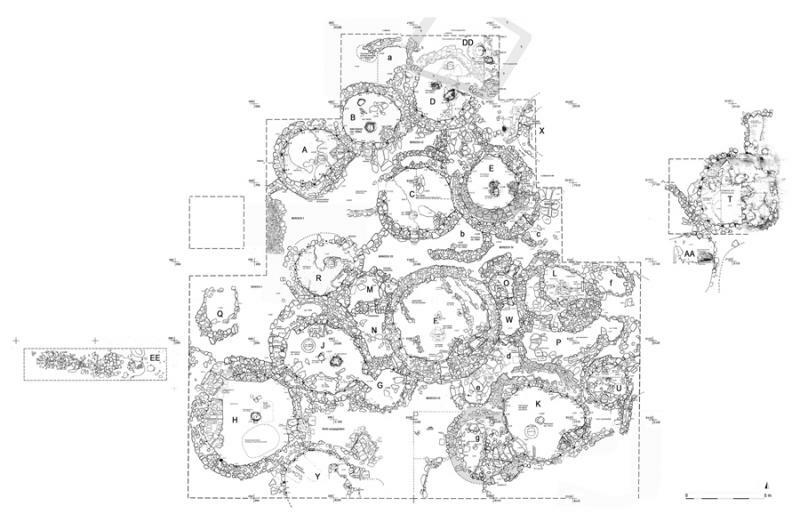 Site plan of Shkarat Msaied, 2010 (drawing by M. Kinzel). Fig. 65. 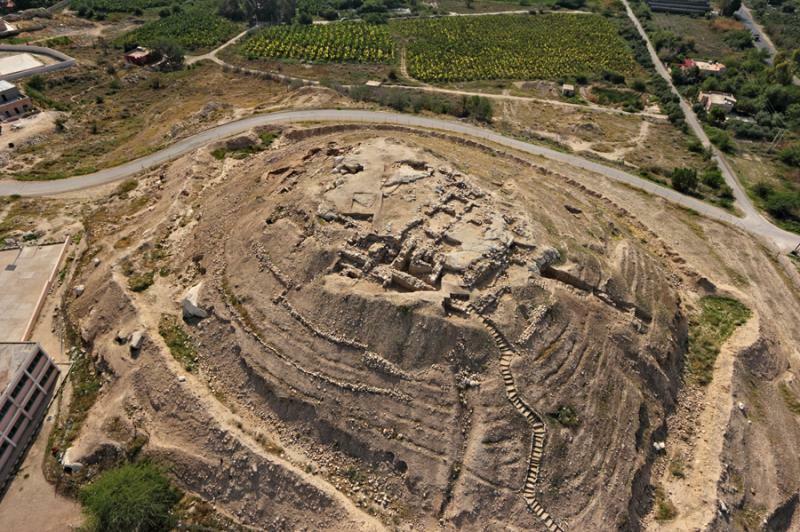 Building H and the southern limit of the settlement of Shkarat Msaied (M. Kinzel). Fig. 66. 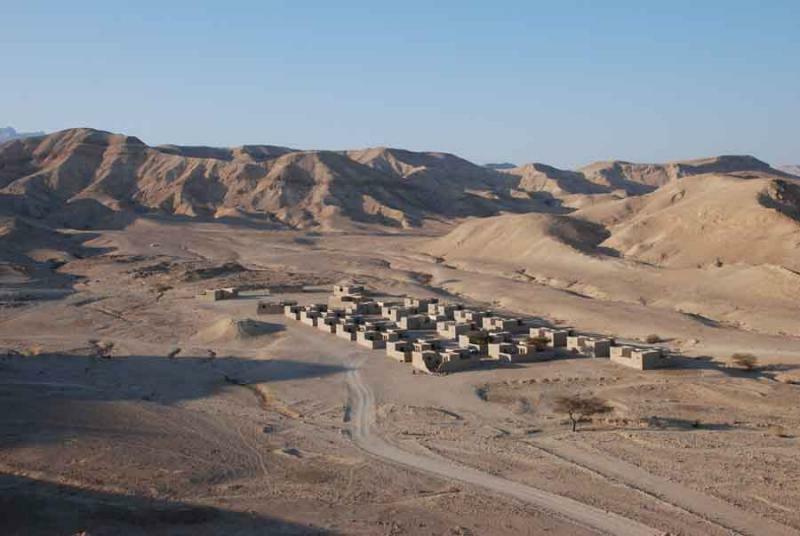 View of Bir Madhkur facing east-southeast in the direction of Petra (A. Smith II). Fig. 67. Partial plan of the structures in and around the Bayda Islamic Village. 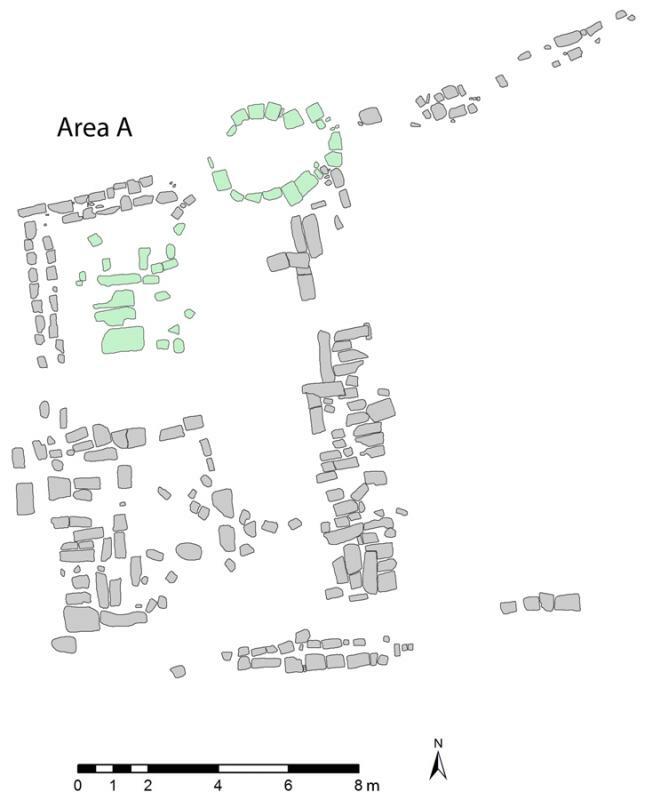 The locations of two Brown University Petra Archaeological Project excavation trenches are shown in white (T. Sandiford and A. Knodell). Fig. 68. 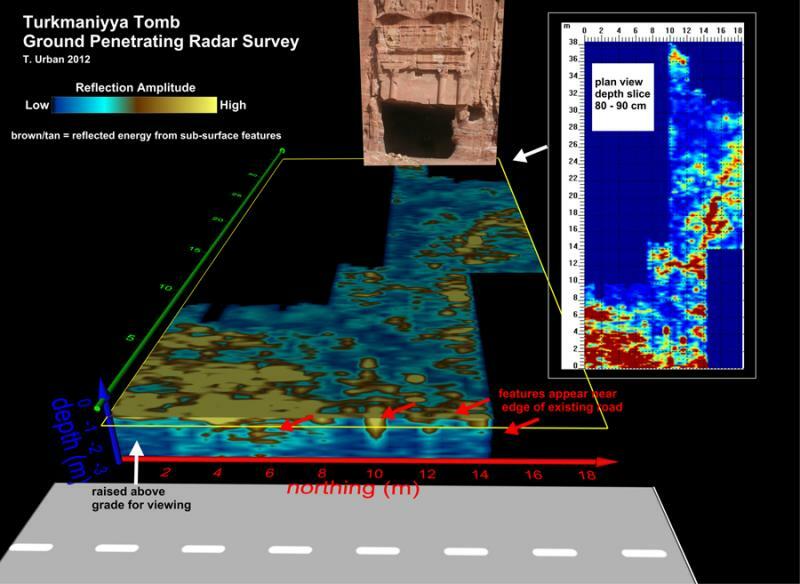 An example of the geophysical survey results from the Turkmaniyyah Tomb Complex in Petra (T. Urban). Fig. 69. 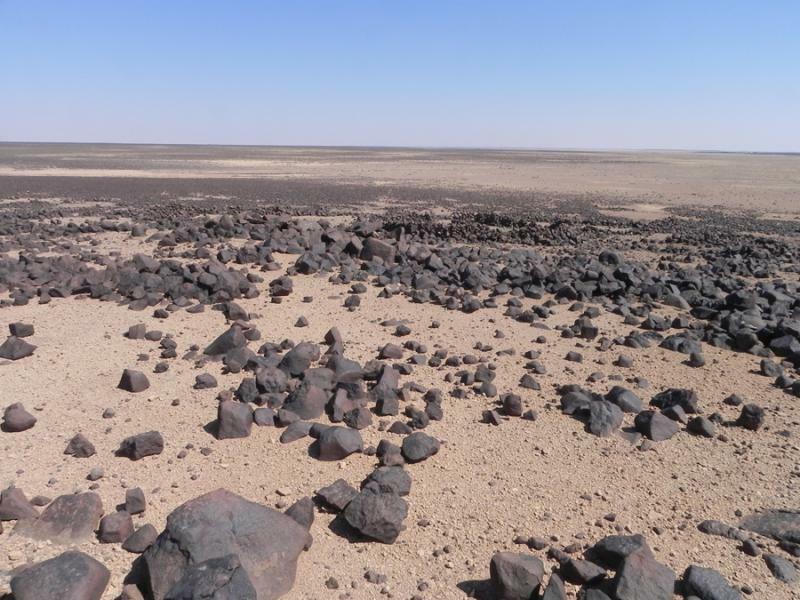 A view to the east (156° N) of the unrecorded, isolated sandstone djinn block at the Disi and Umm Ishrin formations. The tafoni development stops abruptly at the interdigitated lens of the more iron-rich Umm Ishrin sandstone above (T. Paradise). Fig. 70. Three diagrams representing the spatial distribution of tafoni dimension in relationship to aspect. The black circles represent the horizon diagrams of the vista plan from the djinn block. Note the greatest dimensions were found on the southern faces (depth and width), while the largest axes (length) were recorded along the southern, northern, and western faces (drawing by T. Paradise). Fig. 71. Model showing the relationship between weathering rate (mm/millennium), aspect (000°-180°-360°), and solar flux (megajoules/m²/year). 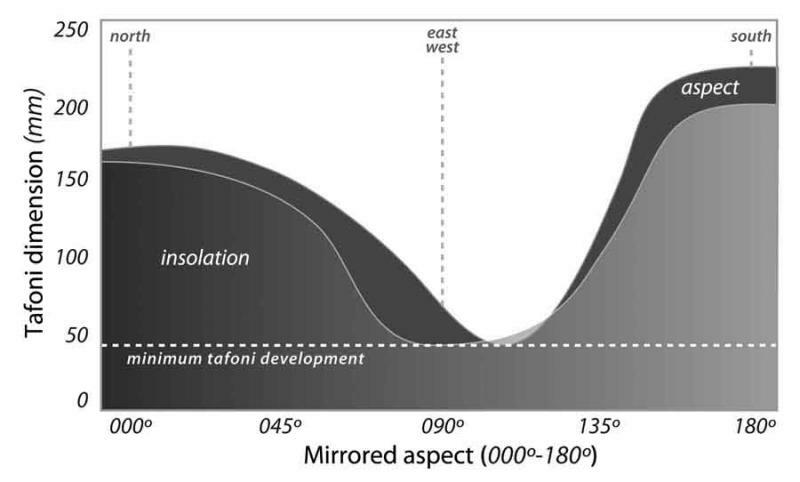 On all sandstone faces, a recessional rate for tafoni development and surface recession of 10–45mm/millennium has been identified, with moderate development toward the north (weakest insolation) and the greatest development toward the south (great insolation) (drawing by T. Paradise). Fig. 72. 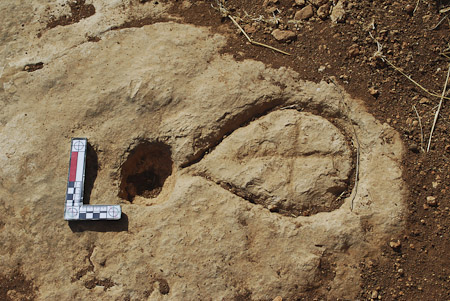 Small biclinium near the cultic Isis niche in the Wadi Abu 'Ullayqa South (M.-J. Roche). Fig. 73. 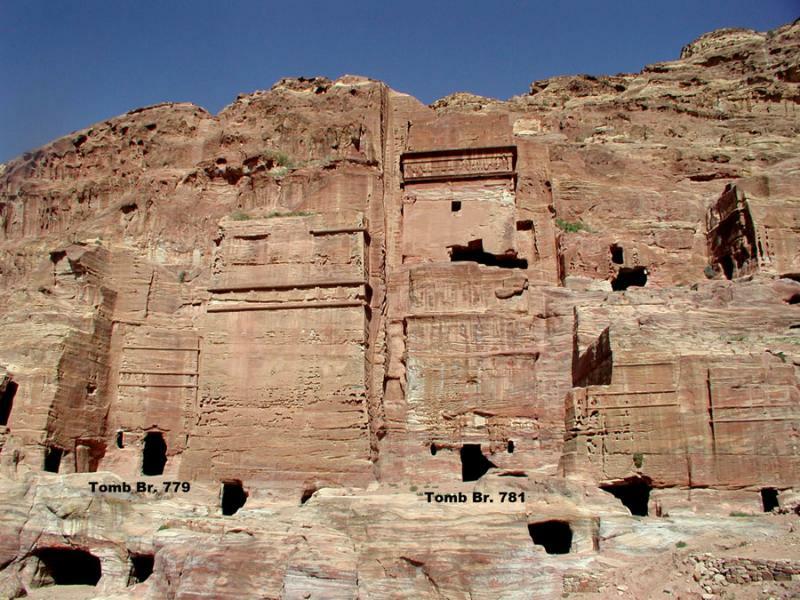 Facade tombs (Tombs Brünnow 779 and 781) at the base of al-Khubthah, Petra (L. Wadeson). Fig. 74. 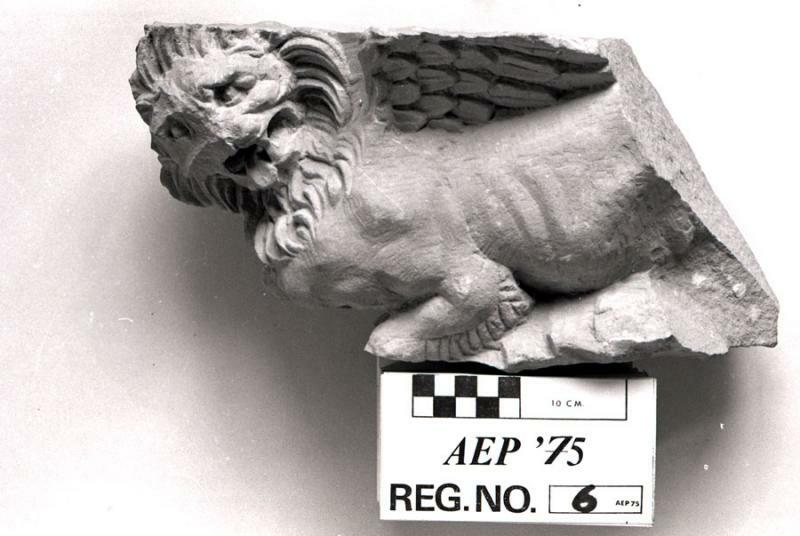 Fragment of a "winged lion" from a capital on one of the columns around the podium in the cella of a temple in Petra. Original photograph from the American Expedition to Petra artifact registries (courtesy the American Center of Oriental Research and the Department of Antiquities of Jordan). Fig. 75. 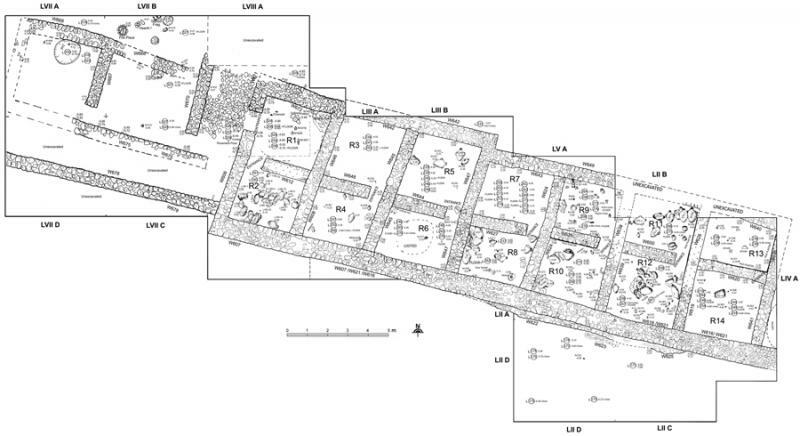 Plan of the Petra Church, showing a section lifted at the west end of the south aisle (courtesy F. Sciorilli). Fig. 76. 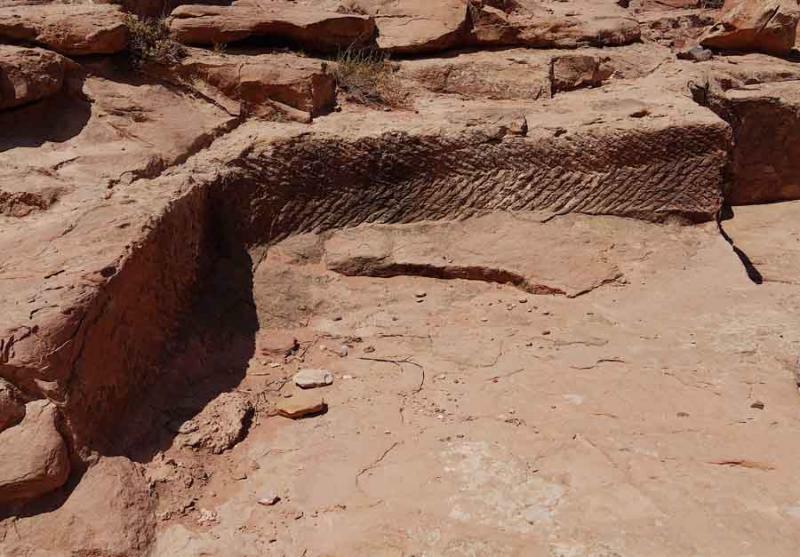 A segment of the Khatt Shabib cutting through square 92 of the Shammakh to Ayl Archaeological Survey (courtesy Shammakh to Ayl Archaeological Survey). Fig. 77. 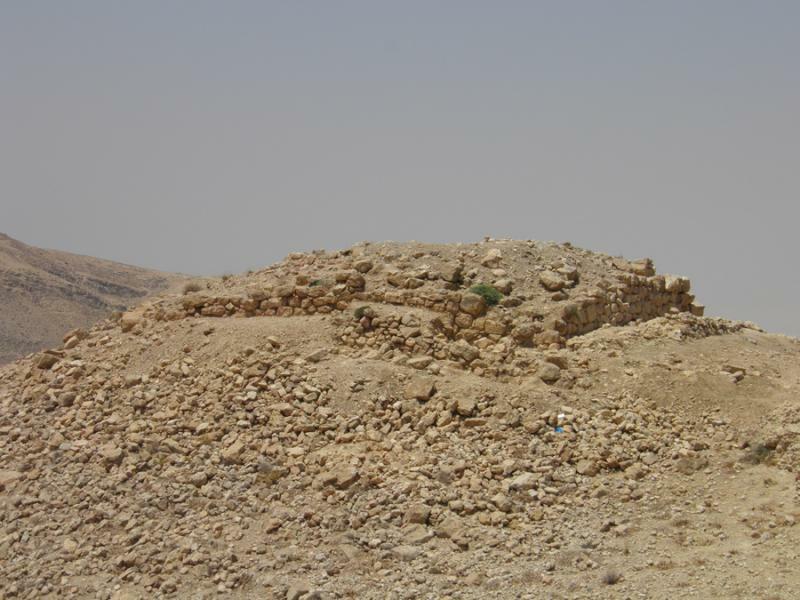 Rujm al-Bitar, a watchtower documented by the Shammakh to Ayl Archaeological Survey (courtesy Shammakh to Ayl Archaeological Survey). Fig. 78. 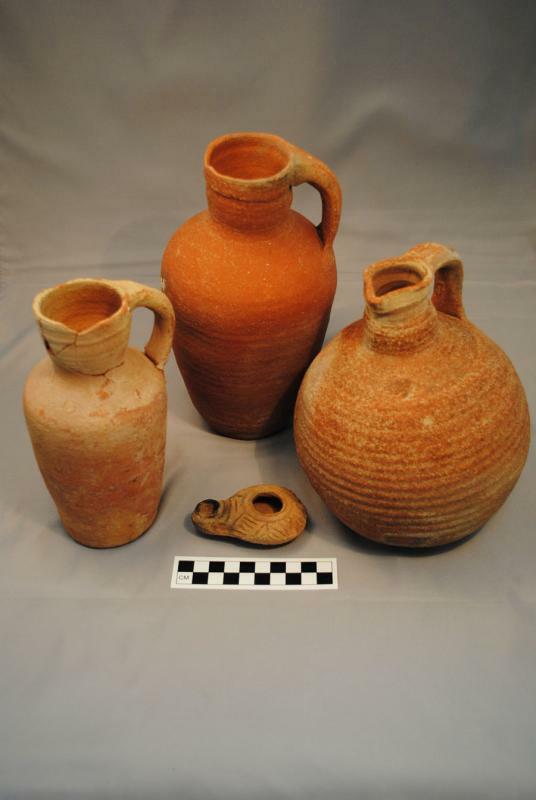 Pottery assemblage from the Late Roman castellum at 'Ayn Gharandal (courtesy 'Ayn Gharandal Archaeological Project). Fig. 79. 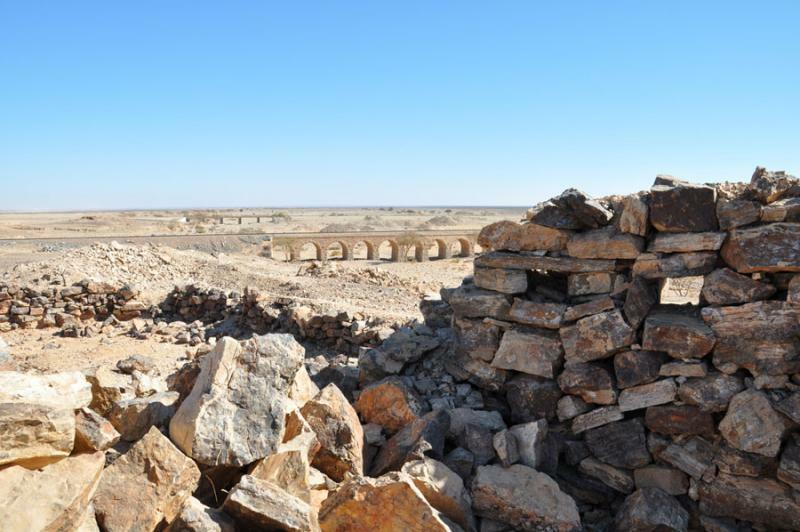 Makin's Fort, an outpost that once protected the Hijaz railway line; view of loopholed wall across wadi to multispan bridge carrying the railway (© N. Saunders; The Great Arab Revolt Project). Fig. 80. Tell Shahm, aerial view of hilltop fort with Ottoman tent-ring camp in foreground (© J. Winterburn; The Great Arab Revolt Project). Fig. 81. 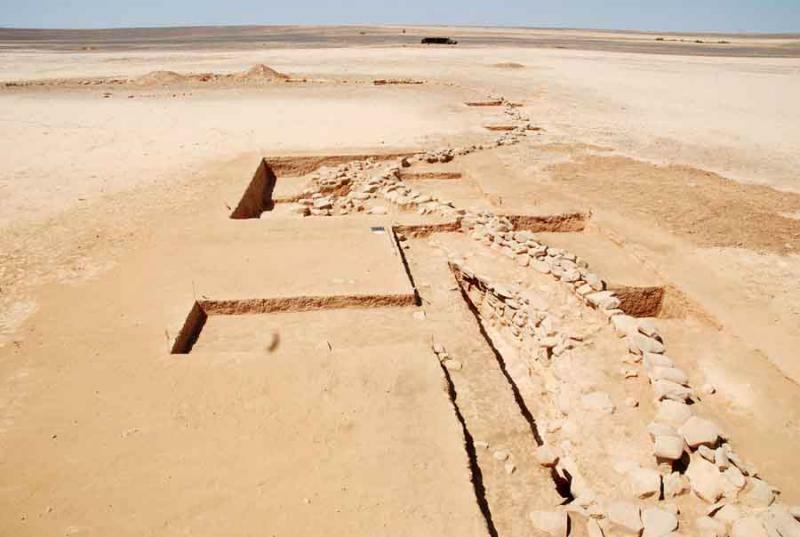 Overview of the oasis (Area G) looking west on Asela, a Wadi Yutm Archaeological Survey site (courtesy Wadi Yutm Archaeological Survey). Fig. 82. 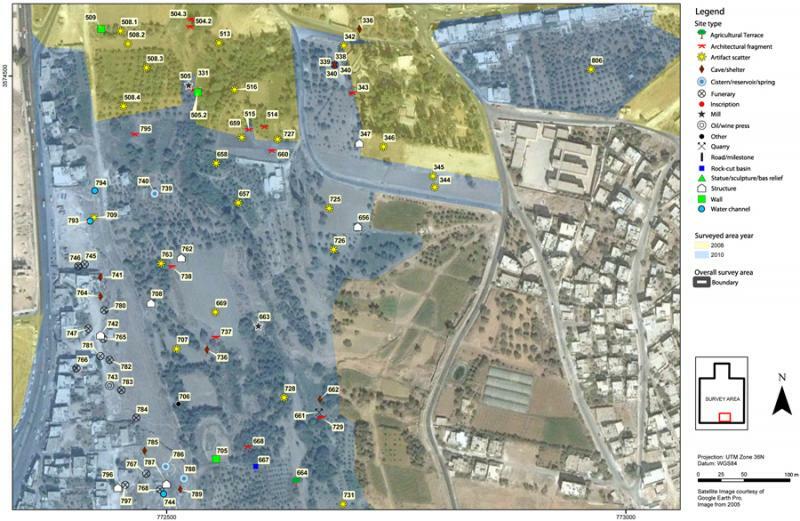 GPS-generated sketch map of Mughra, a Wadi Yutm Archaeological Survey site. 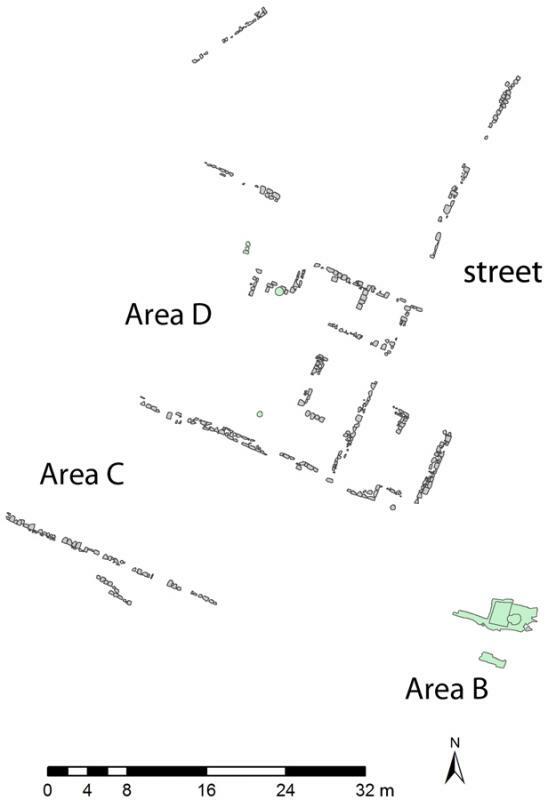 Main site area is Area A; the cemetery is Area B (J. Scott). Fig. 83. 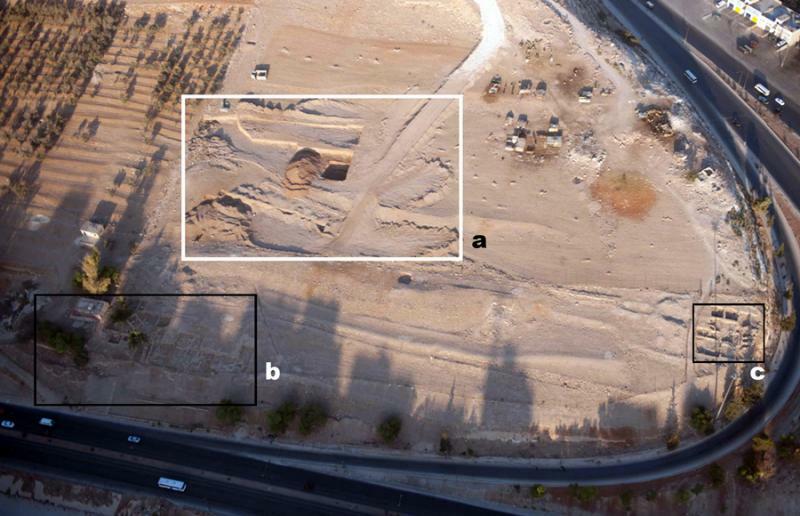 Oblique aerial view of the excavation area at Islamic Aylah (courtesy Aylah Archaeological Project).